Touching allowed. 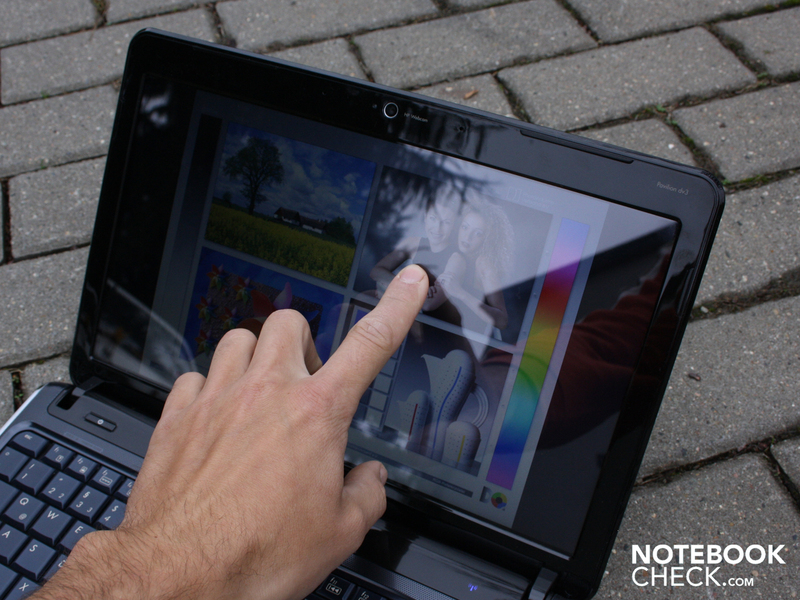 The Touch notebook can’t decide if it’s for entertainment or technology enthusiasts. 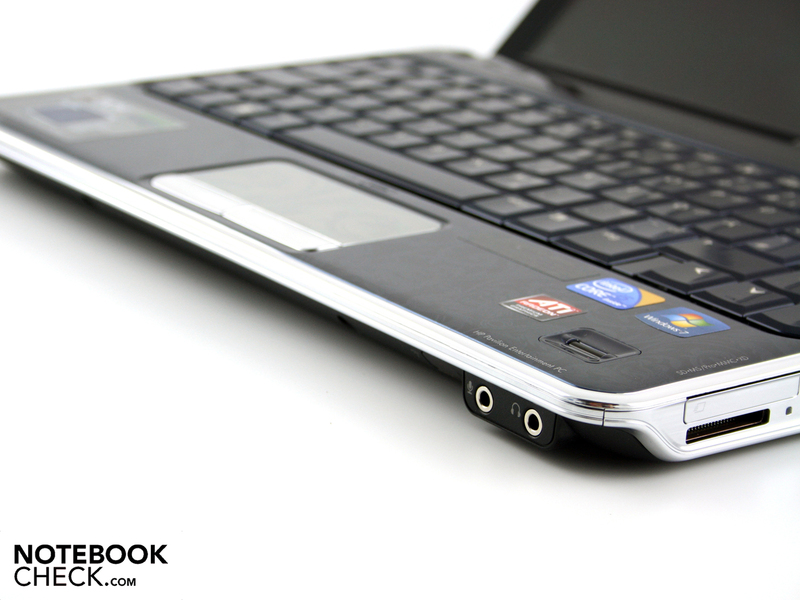 An ATI Hybrid Graphics, strong Core i5, 7200 rpm HDD are all oriented toward performance. The hand input function rounds out the whole package. The whole world seems to be inspired by touch inputs. They are available in all-in-one PC displays, smart phones and in tablet PCs. Standard notebooks are less often the focus of some touch-enthused producers. After the 15.4 inch Acer Aspire 5745PG-5464G32Mnks with a touch panel, we’ve acquired the smaller 13.3 inch HP Pavilion dv3-2390eg (VY336EA). With its 1366 x 768 pixel glare type display, inputs can be entered by finger touch. 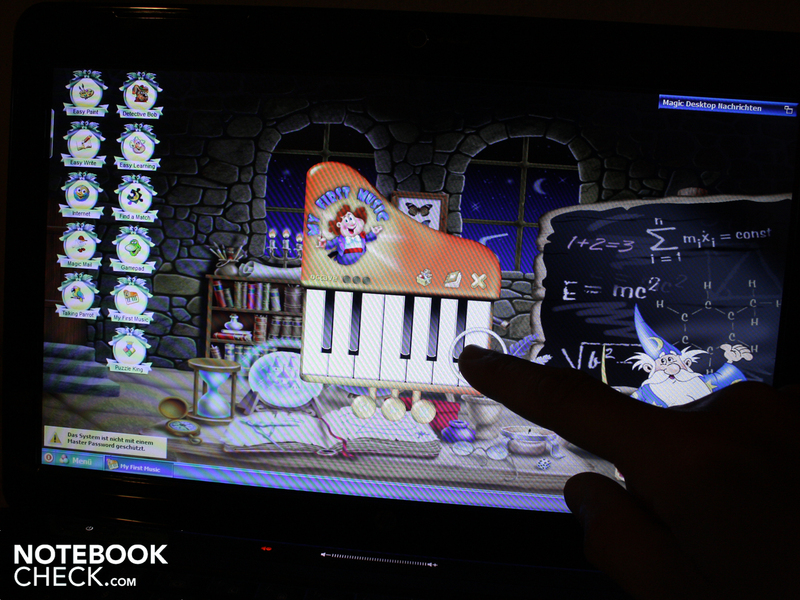 In the spirit of an “entertainment notebook PC”, as the dv3 is referred to by the producer, there is plenty of entertaining software on board, most of which are educational or entertainment programs for children. 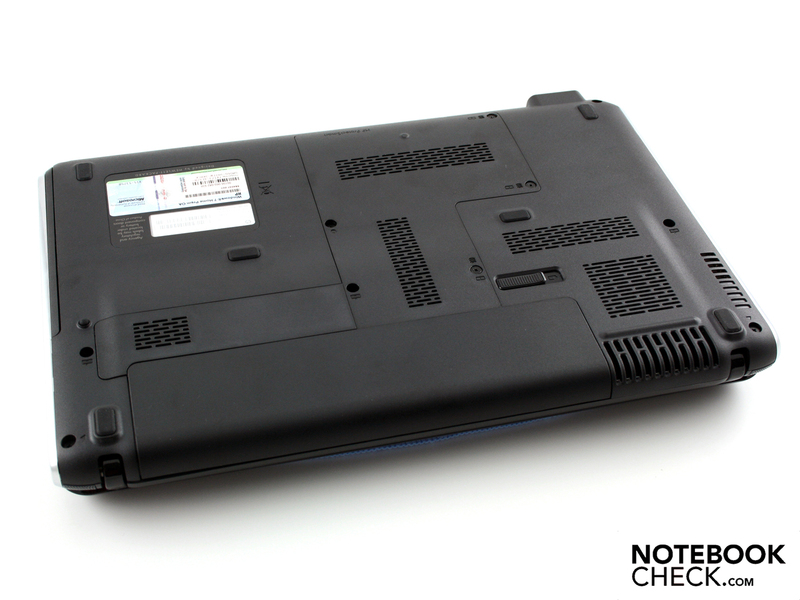 We found out in this review whether or not the dv3-2390eg can operate other facets of a notebook. What about the mobile aspects and the input devices? Is a lame office box hidden beneath the pretty glossy design, or rather a high-performing, of a handy 13.3 incher? All the relevant information will be revealed in this review. 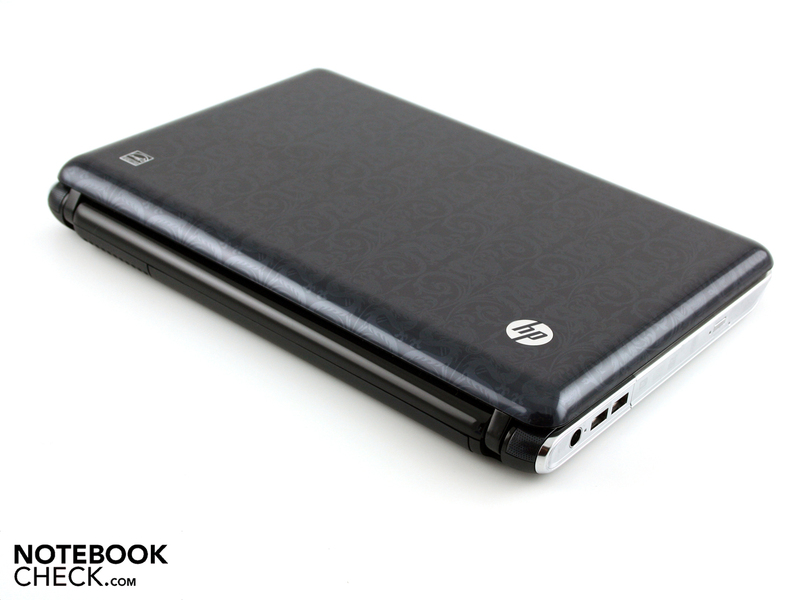 The HP dv3-2030rg comes on stage as a typical representative of the Pavilion-Designs. 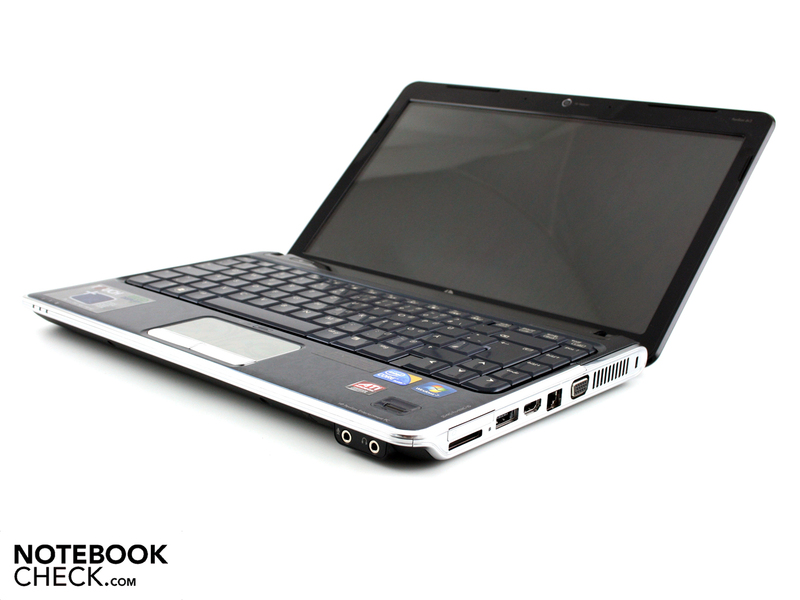 The design is the same as its big brother’s, the dv6 and dv7 (16 or 17 inch). The chrome-colored plastic of the sides surrounds the 13.3-incher and highlights the connection ports. 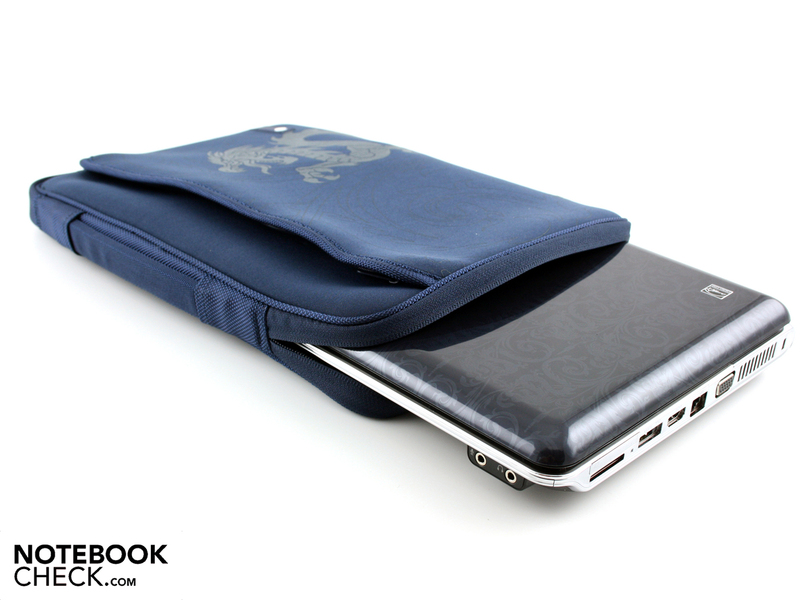 Most notebooks tend to have simple black plastic here, as they aim to minimize the visual emphasis on the open spaces of the ports as much as possible. The Pavilion on the other hand has no problem with this and proudly shows off what it offers. The high-gloss finish might not be to everyone’s taste. Fingerprints and, after a while, dust become visible across the entire surface, even on the slightly shiny keys. 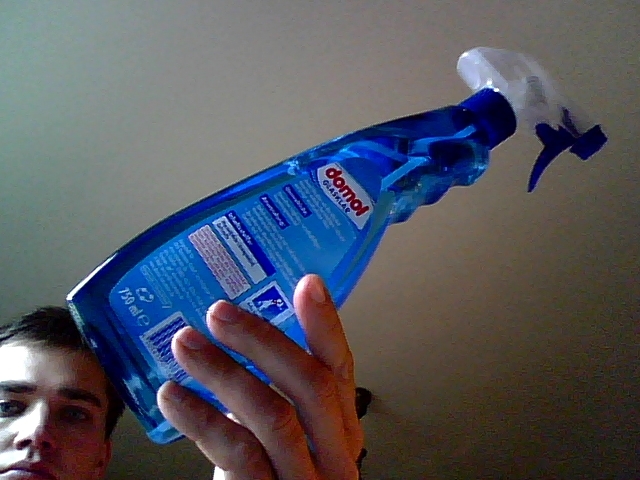 The included polishing rag is therefore of utmost importance. The roundish impression suggests great stability, and this impression is confirmed. We could very slightly bend the base unit by holding the corners of the palm rest with both hands. However, the palm rest sits securely and we couldn't dent the surface at any point. The lid is very thick (14mm). The strong frame provides high torsonal rigidity. By adding pressure, we could only dent the surface of the lid a bit in the middle. The very firm hinges carry on this good impression. 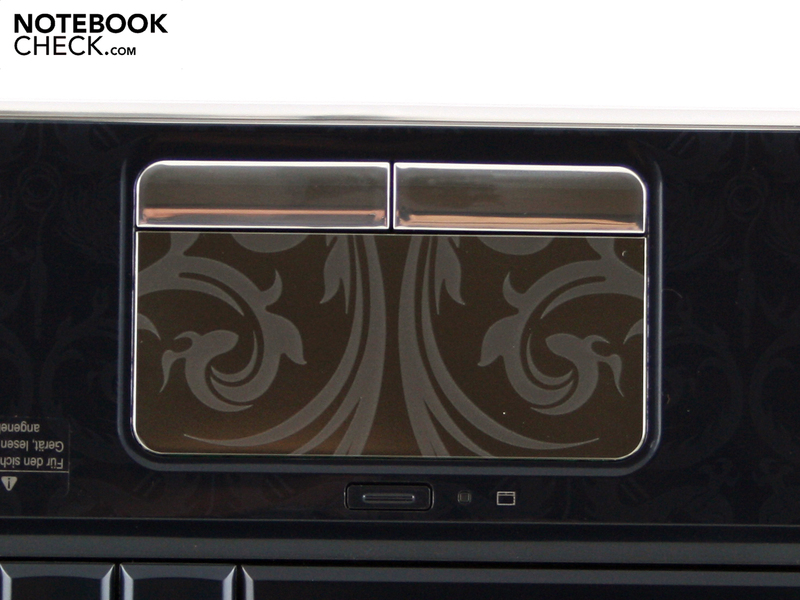 They hold the heavy lid firmly in place, which is especially desirable considering the touch feature. When typing normally on the touch screen, the lid doesn’t open any further than is desired. The imprint finish on the lid and the palm rest has style and the moulded screened sheet above the keypad gives a high-quality impression. 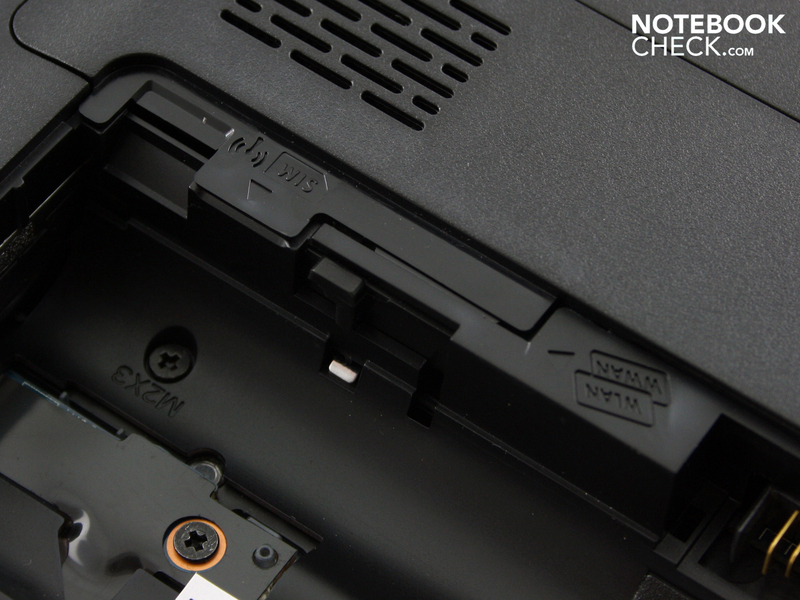 The screened sheet founds off the back of the dv3 (including the stereo loud speakers). 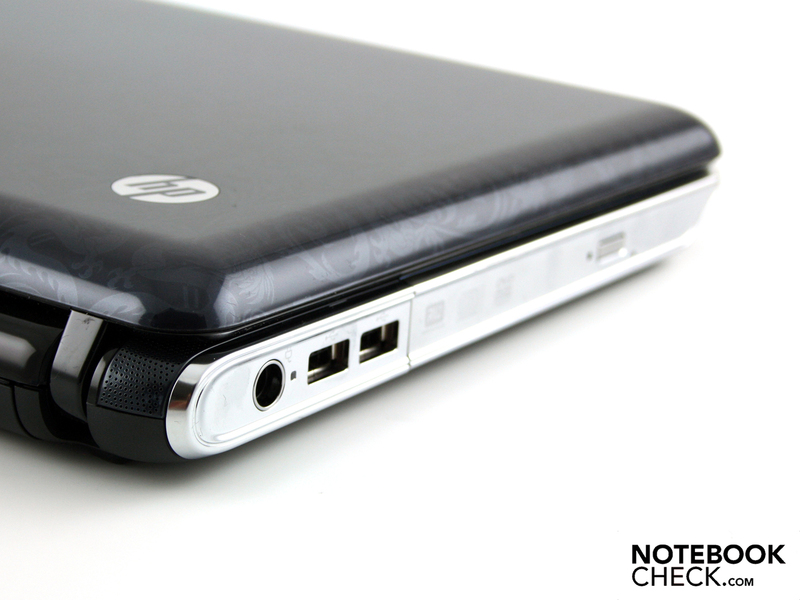 In terms of connection ports, HP did things right and invested in everything which could possibly fit into the limited space. In addition to three USB 2.0 ports, one of which is combined with eSATA, we found the bulk of connections on the right side of the case. 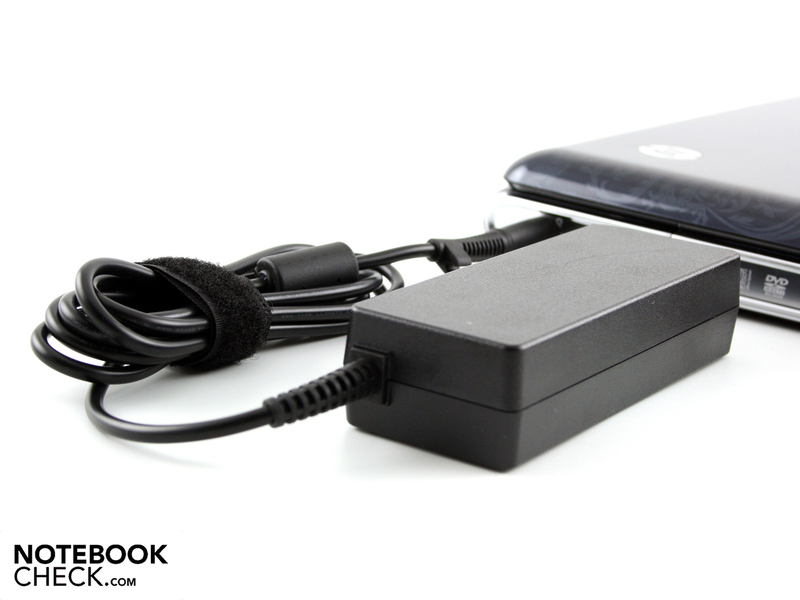 The eSATA USB combo port is suitable for fast external hard drives. Those looking for more ports can use the ExpressCard34 extension port to upgrade with audio, tv or controller cards. This is not a given on every 13.3 incher. 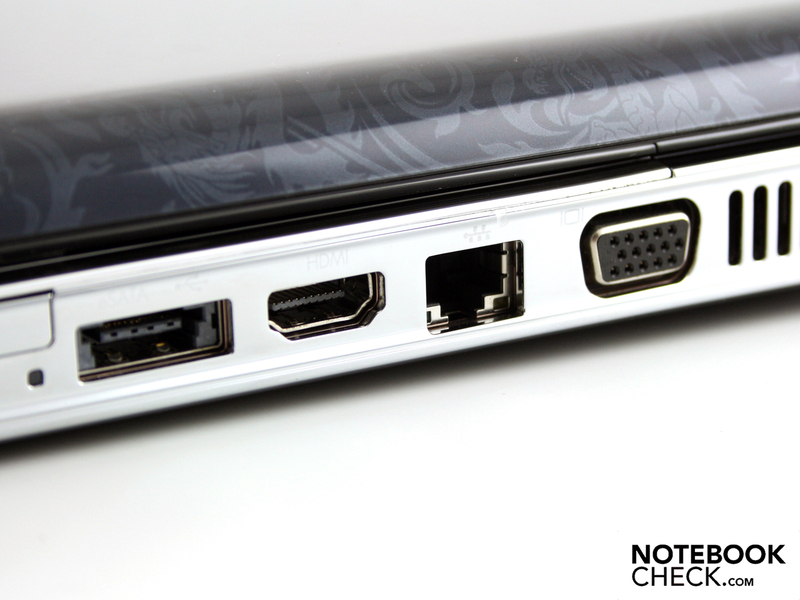 A card reader is also included, as well as HDMI and VGA. It also supports xD-Picture Cards. The network connection via cable or radio is modern, but nothing really special. The Realtek PCI Express GBE Family Controller (Gigabit LAN) and the Intel WiFi Link 1000 BGN (DraftN) send and receive at the fastest standard rate. Though the manufacturer left out Bluetooth, this is compensated somewhat by a small infrared remote control. 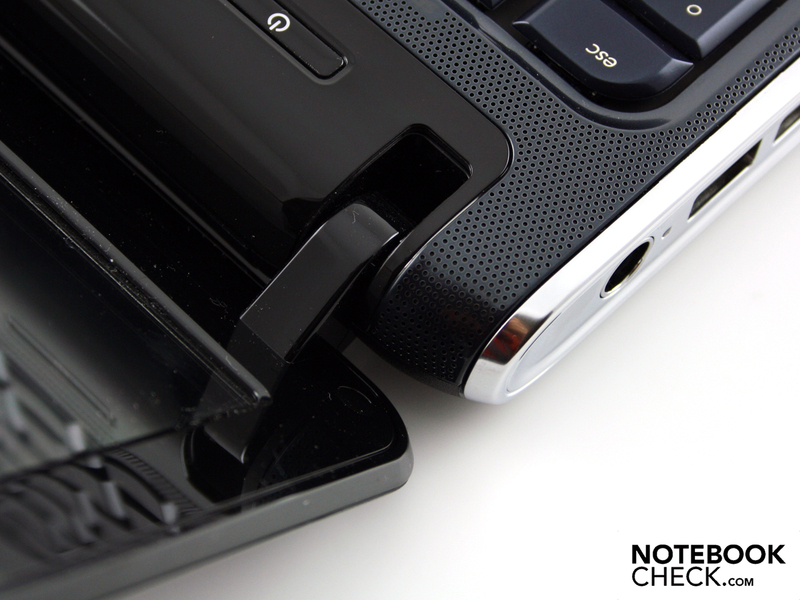 It can be housed in the ExpressCard/34 slot, but note recharged there. 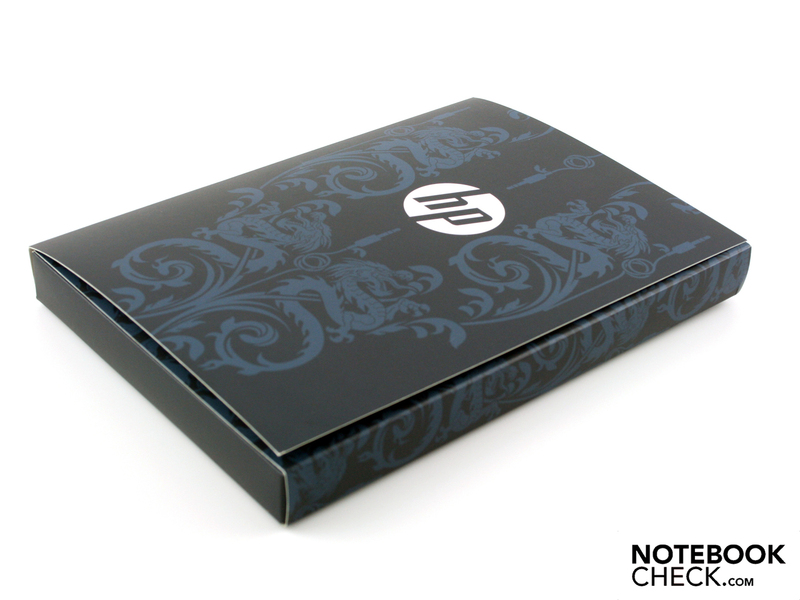 HP included no data storage devices such as a driver/Software Recovery DVD. The box contains a remote control CIR (Consumer Infrared), the guarantee card, information on the hybrid graphics card and a quick-start guide. Users have to burn the recovery disk (Windows 7 Home Premium 64-bit) themselves via the HP Recovery Manager (Tool for DVD creation). The user can expect to find a variety of full versions included on the harddrive. These include the EasyBits Magic Desktop (for children), Corel Paint Shop Pro Photo X2 and the CyberLink DVD Suite. Those who want to jump right into using the Touchpanel will surely play around a while with Bumptop, DigiFish Dolphin and the MegaTouch game package. Unlike the cheapest HP models (625 HP in the test, 12 months carry-in), the Pavilion offers a 24 months collect & return guarantee. Writing with the keyboard is halfway pleasant. It sits firmly and bends only under excessive pressure over the optical drive. The keys have a clear pressure point, a good hub and a solid but slightly dull stroke. 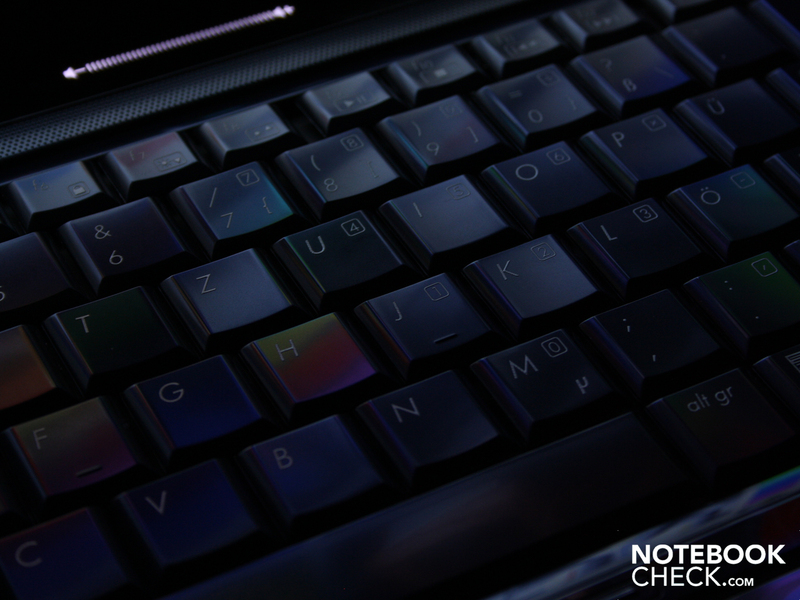 The typing feel is purposeful thanks to the generous keyboard layout and the pressure points give good feedback. 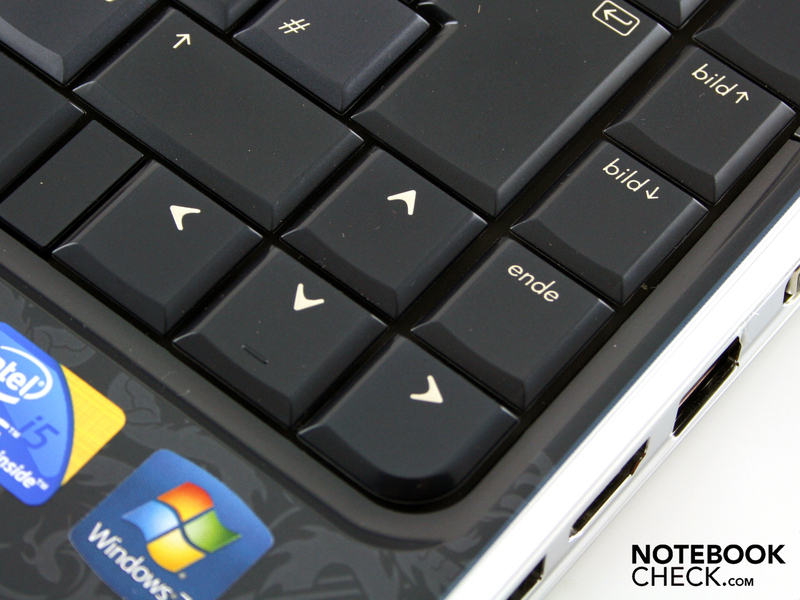 Even the much criticized arrow keys on notebooks seem very large. The only drawback in typing is posed by the smooth surface of the keys. Over time, an ugly grease forms here which certainly isn't consistent with the overall look. The mouse control on the smooth mousepad works quite accurately, but the feel isn’t for everyone. 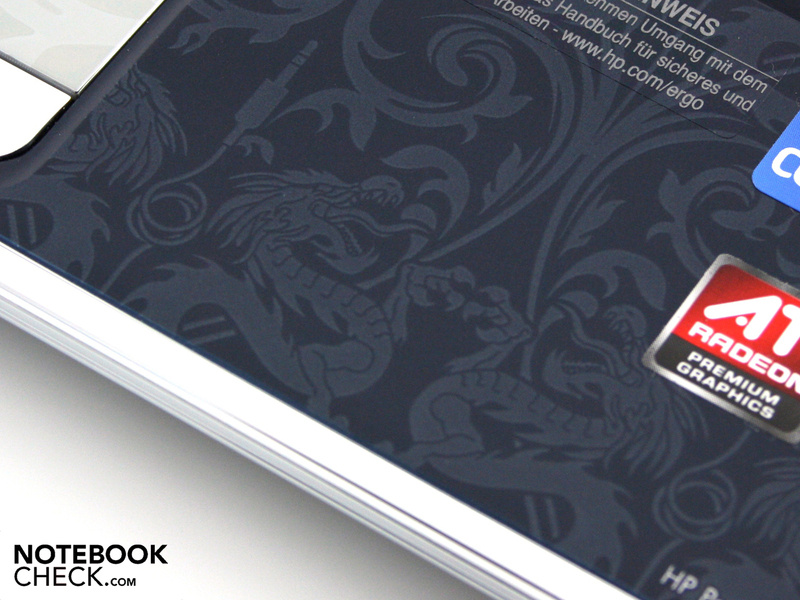 Because the silver, patterned surface is mirror smooth, the surface gets quite greasy. If one exaggerates a bit, you get the impression that a tub of Nivea has been smeared all over it. Unfortunately, the equally smooth and shiny buttons continue this trend. They also give a loud, annoying click, as the key hub has been kept exceptionally taut. On the whole, this gives the keys pretty poor feedback. We quickly came to terms with the finger input function and not even a fine-tuning (sensitivity, accuracy) was necessary. Even a very delicate touch of the buttons or a light double tap is enough to perform click/double-clicking. Whoever might want to use a Stylus Pen or a blunt pencil for input will be disappointed. 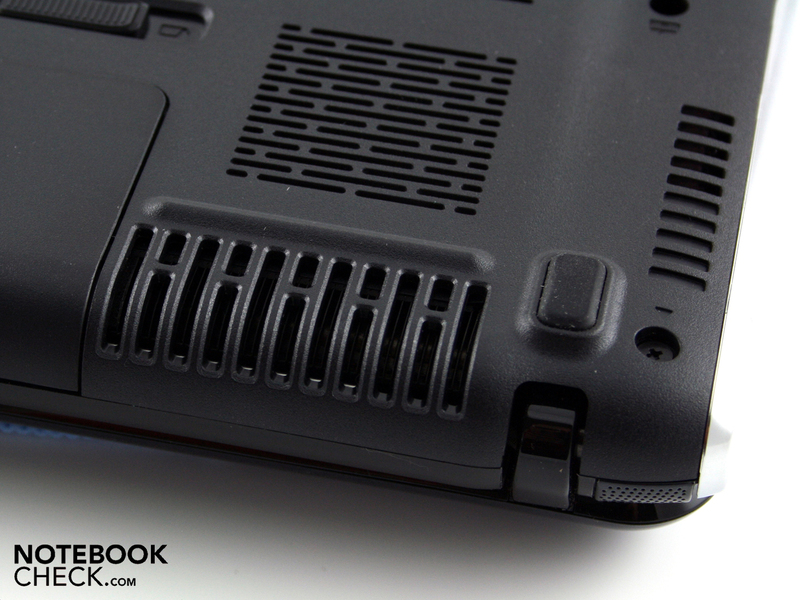 The panel responds only to skin contact, even a finger nail or a pencil eraser has no effect. 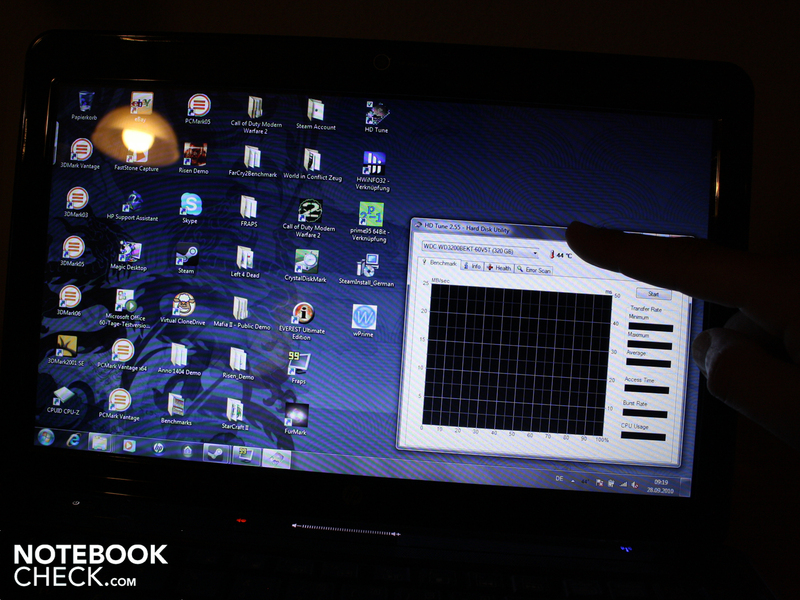 We were able to install and carry out all the benchmarks and analysis tools using finger touch (except for games). 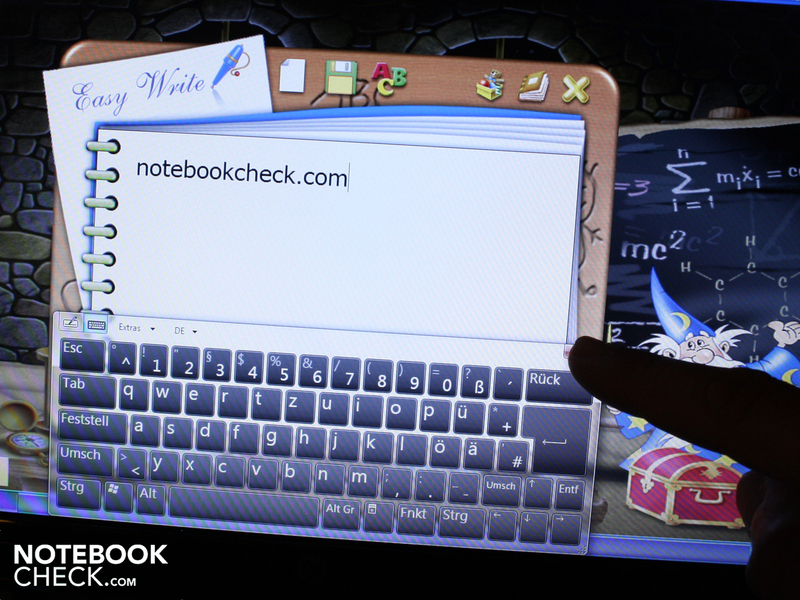 Text input appeared on the screen. This is handled by Windows 7 with the onscreen keyboard. As soon as a box is touched, for example, the URL bar in the browser will open a small key icon which then opens the on-screen input function. Of course keyboard shortcuts such as Ctrl + C or Str + P can be initiated. How does a finger replace the right mouse key? When the finger touches the screen for a half second, a circle appears, and after lifting the finger, the context menu. The so-called multi-touch, as we know it from smart phones or laptop touch pad, is also available on the panel. Now, two or even three fingers can be used. 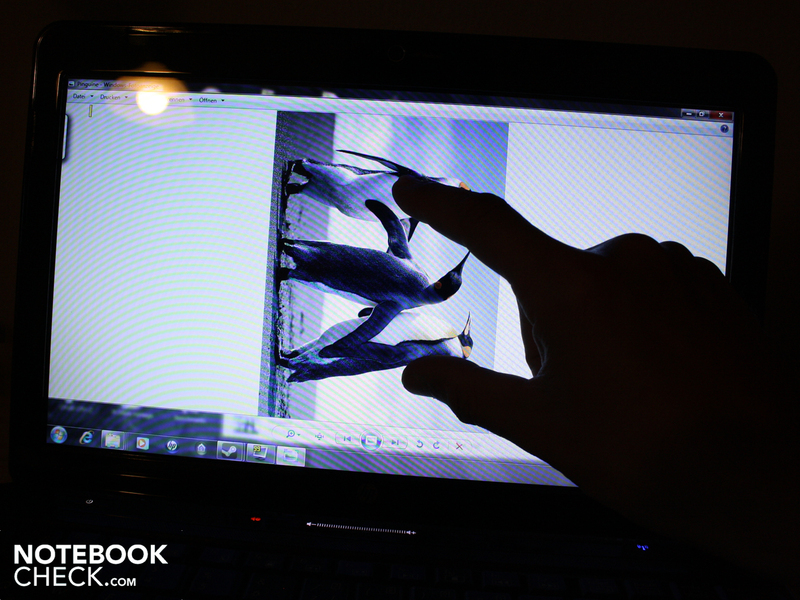 In the image viewer, we can zoom in by pulling or pushing two fingers. The rotation of two fingers turns a photo around. 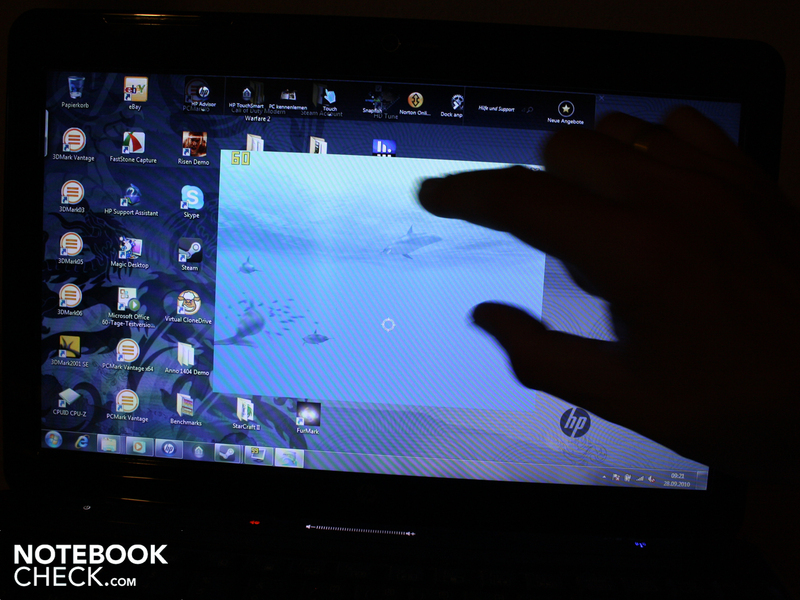 A wiping motion switches to the next screen, or scrolls down a Web site. With practice, highlighting specific texts is possible. All this is known from the current smartphones like the iPhone and aren’t novelties anymore. Input on the screen works, there is no question about that. 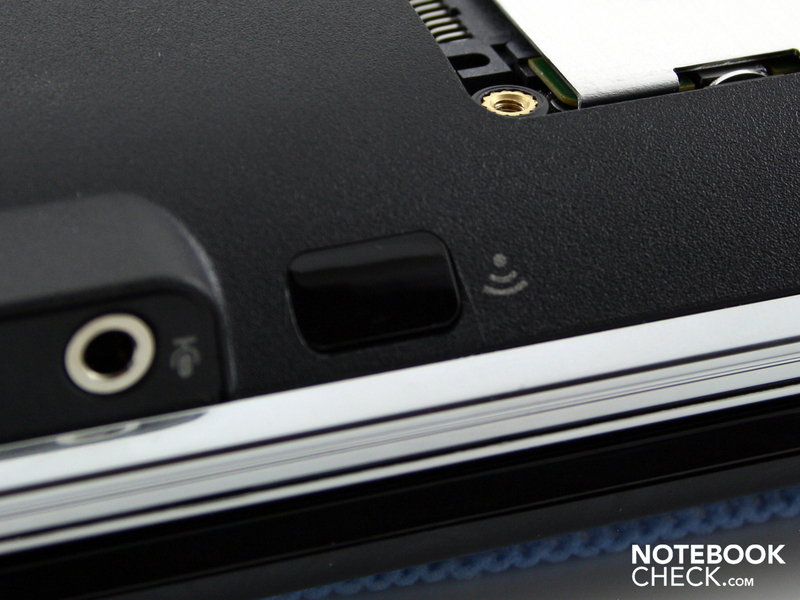 There is also no doubt that this type of input is the best input option for tablet PCs/convertibles and smartphones. 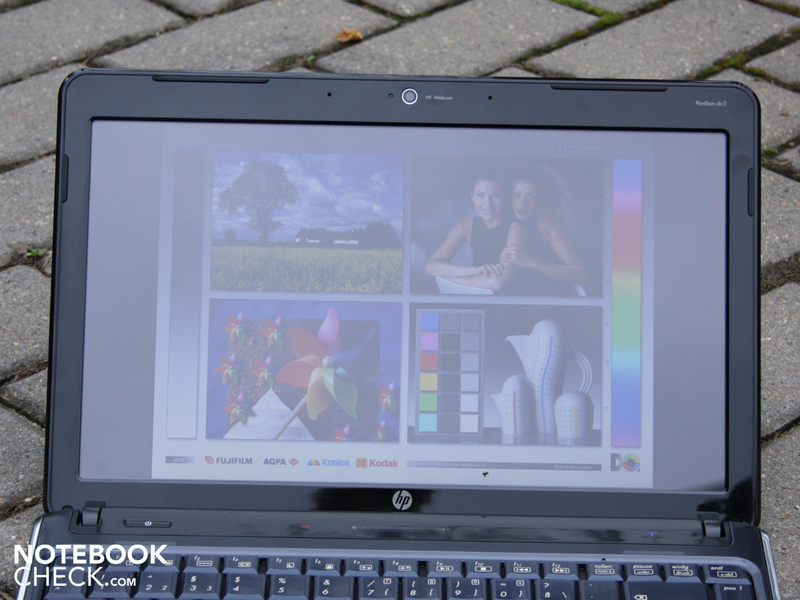 The question of whether the touch option is most useful in the notebook form factor (without being a convertible) is one potential buyers will have to pose themselves. Still, it is less of a question of price as similarly configured 13.3 inchers without a touch panel cost at most 100 Euro less and go by names like Acer Aspire TimelineX 3820TG or Lenovo IdeaPad Z360 (soon to be in review). 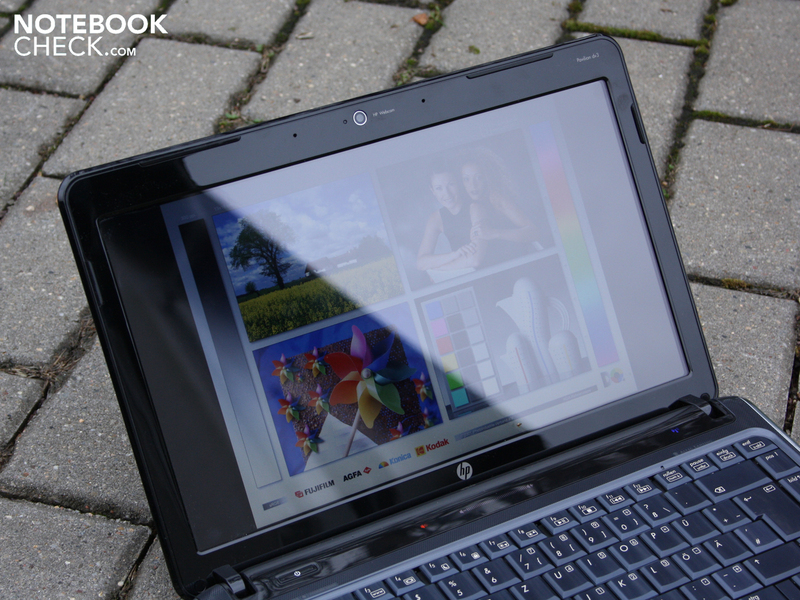 In terms of the display of a multimedia laptop, even if it is a 13.3-incher, two issues are important: resolution and contrast. Brightness matters a lot only in cases of outdoor use. 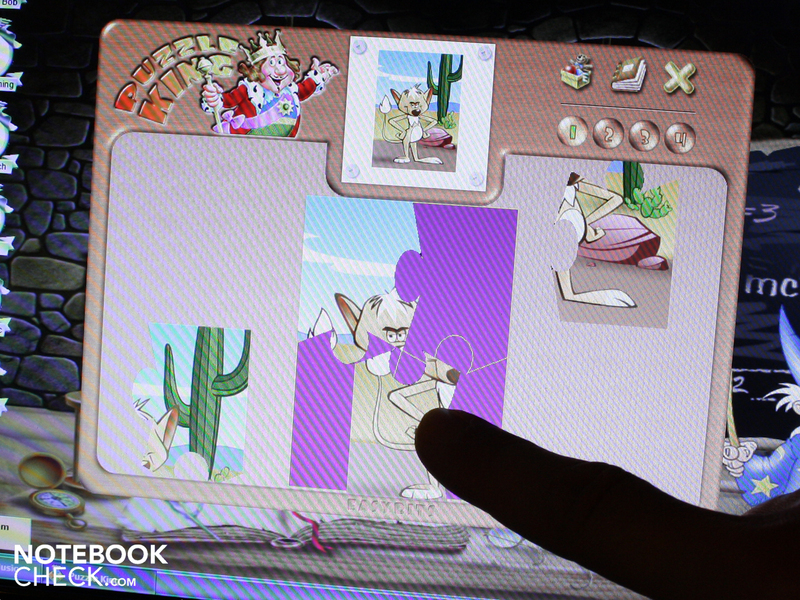 The dv3 touch panel has a resolution of 1,366 x 768 pixels (WXGA). A higher resolution is not desirable for this form factor and wouldn’t be usual in this price range. The dv3 disappointed fans of brilliant colors and high contrasts with its black level of 1.21 at maximum brightness. The contrast is calculated at only 150:1, a very low value. Black therefore has an understated gray appearance; colors don't radiate particularly well. 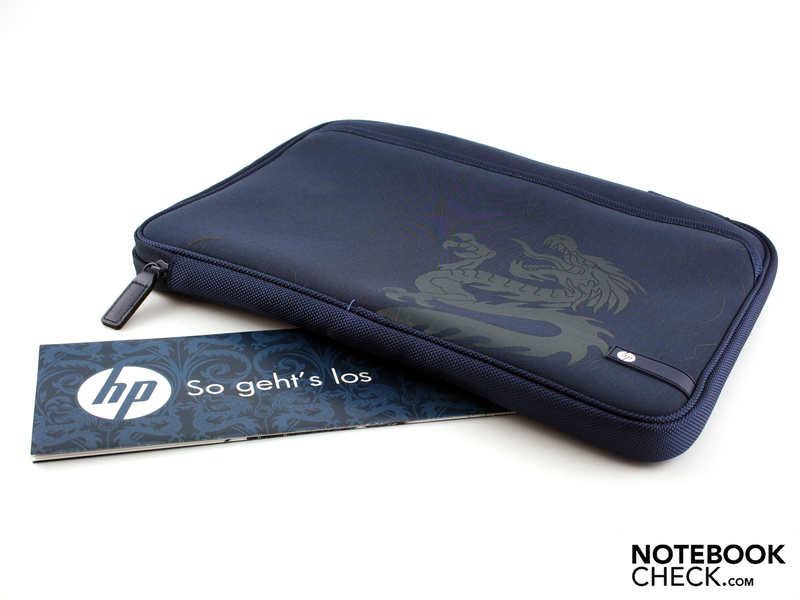 Such a low contrast is typical for office notebooks, netbooks, and unfortunately also for subnotebooks and respectively middle-class multimedia notebooks. 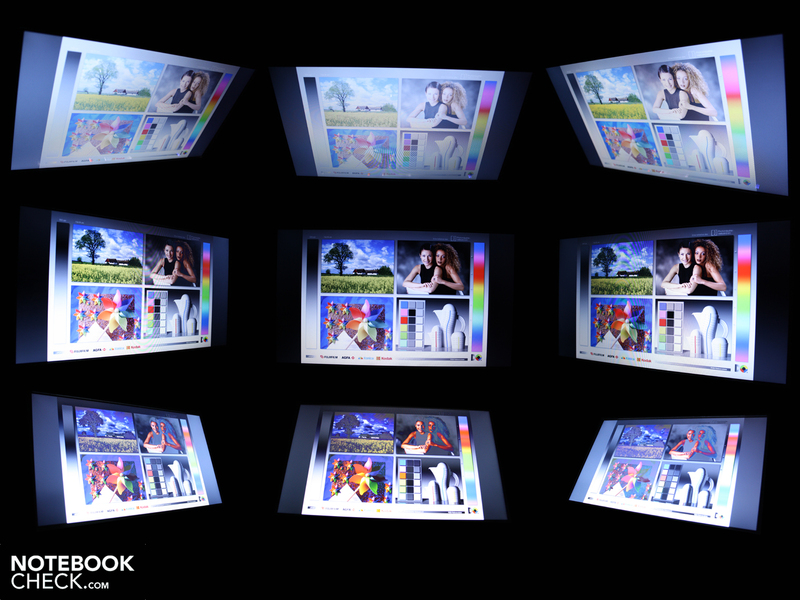 In terms of the color space coverage, the display panel proves itself to be of the average sort. As a counter example we’ve compared it to the LP133WH1-TLA2 panel in the dv3 to the HP Envy LCD0E09 14. According to our measurements (i1Display 2), the LG-Philips panel covers just half of the Envy-color space (extended). The brightness is important for applications in daylight. While 150 cd / m² is certainly enough for certainly for use on one's desk, the average of 178 cd / m² we got was not enough for outdoor usage. Whoever wants to sit out on the patio will need at least 230 cd / m². The evenness of the illumination is very good at 87%, so that no spots (on a black screen) can be seen with the naked eye. 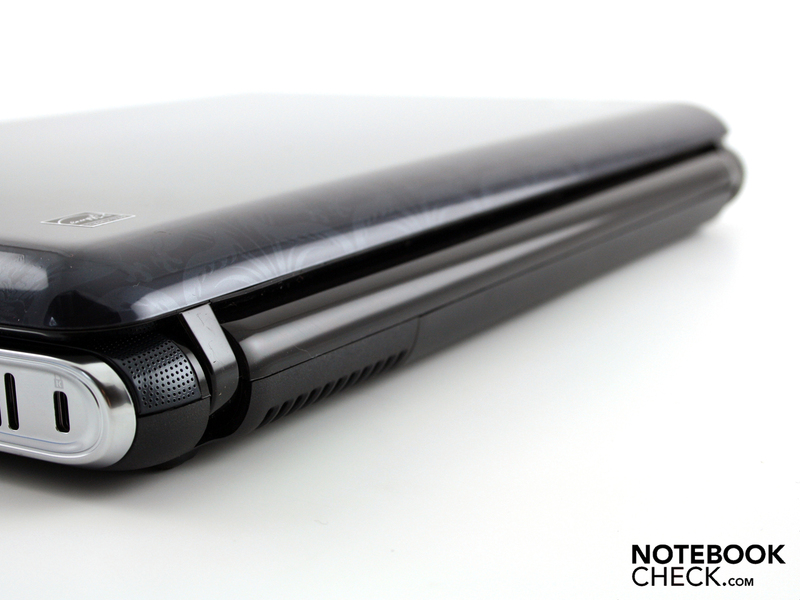 This dv3 is a notebook for the living room or the kitchen. The anti-glare 13.3 inch display produces heavy reflections. Due to the low brightness, the glare panel does nothing to adjust itself to the sun's rays. In keeping with the minimal contrasts, the display therefore seems dark and washed out. But we didn't notice that under heavy cloud cover, the setting in which the accompanying photos were taken. The photography illustrates the horizontal and vertical viewing angles. If the viewer's eyes vary vertically (up, down), then the colors invert very quickly. The colors seem pale already at 15 degrees, and at 30 degrees, the effect is extreme. Should the viewer vary their position horizontally, then the illumination and the color intensity stay stable up to about 50 degrees. Only after that point do parts of the image darken and do the colors invert. The 13.3" display is therefore suboptimal for watching films as a pair or a group. 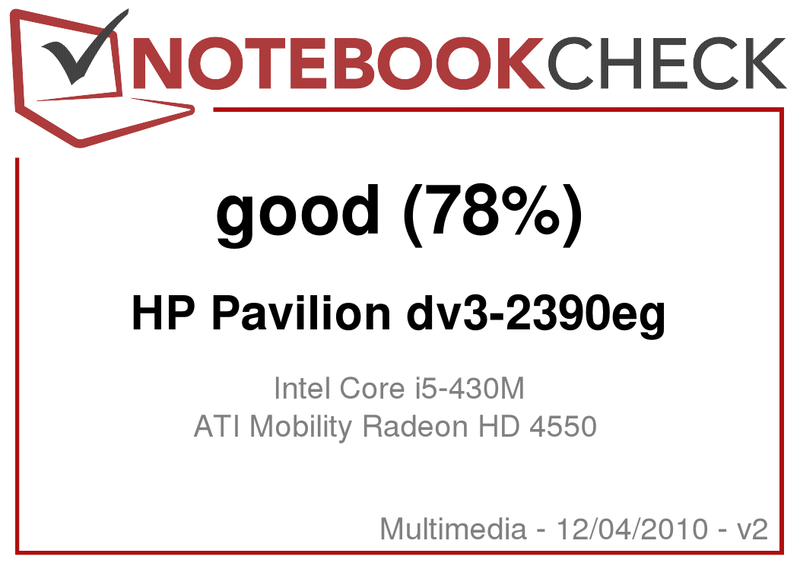 HP equipped the Pavilion DV3-2390eg (VY336EA) with a Core i5-430M. The CPU has two cores, each with 2.26 GHz, which is the default clock speed. The real speed during operation can be increased up to 2.53 GHz (Intel Turbo Boost). Here, individual cores of the CPU are automatically over clocked. How high exactly is determined by the processor after it determines how many cores the application(s) want(s) to process. Hyper-Threading is another characteristic of all Core i5 and Core i7. With this, the two physical cores are supplemented by two virtual ones. 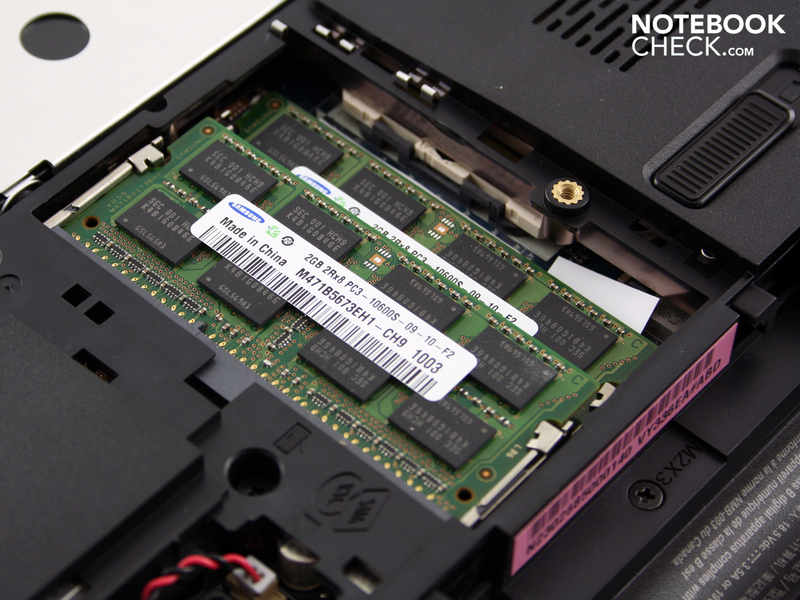 In terms of the main storage memory, 4,096 MB of RAM DDR3 (PC3-10600) are called to action. 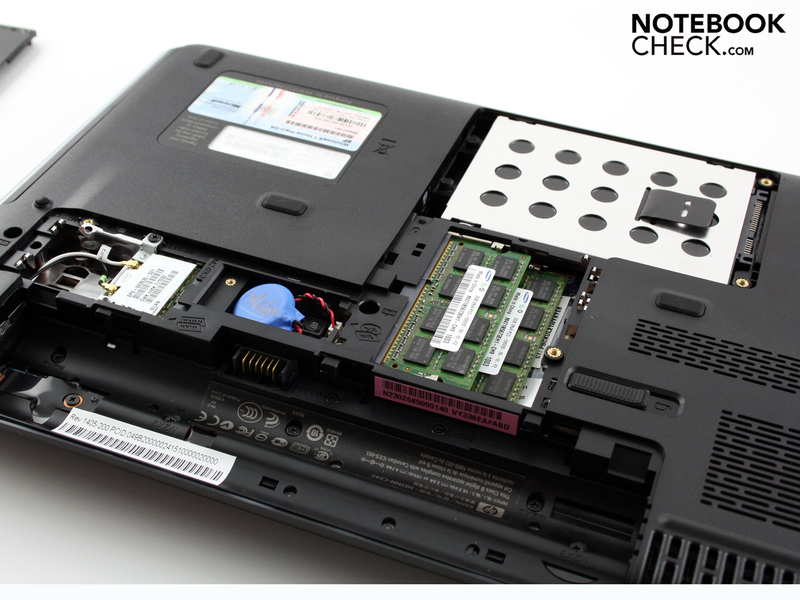 The 4 GB on two DDR3-bars are accessible to the user under the maintenance port on the base unit. 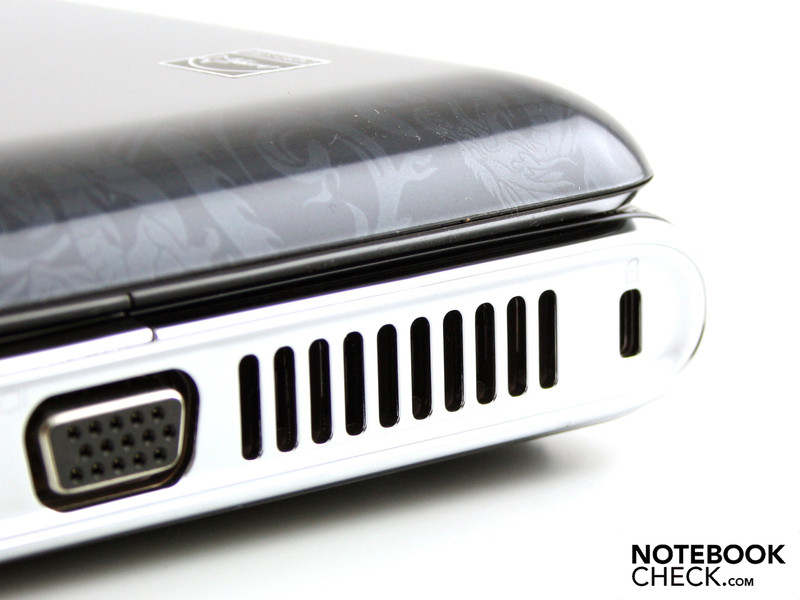 The ATI Mobility Radeon HD 4550 is a seldom used video card. 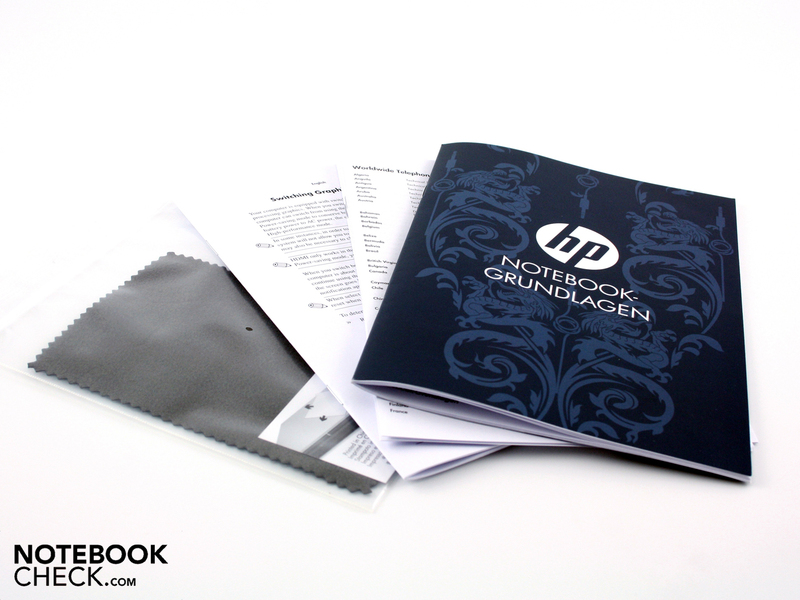 But HP is happy to employ it, such as in the HP ProBook 6540b WD690EA and in the HP Touchsmart tm2 Convertible. The GPU can access 512 MB GDDR3 (according GPUZ). The memory clocks with 800, the core with 550 MHz. 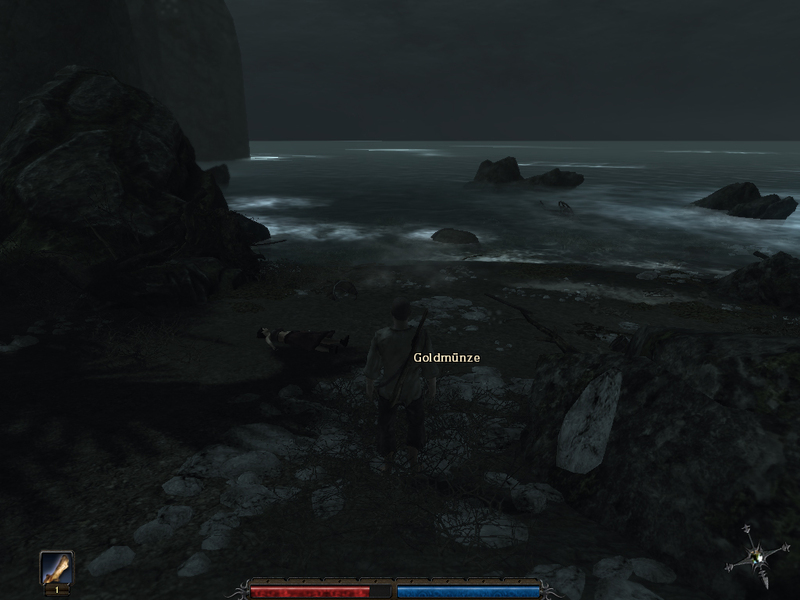 The GPU commands DirectX-10.1 effects. Its suitability for gaming is limited. A hybrid graphics solution is implemented. 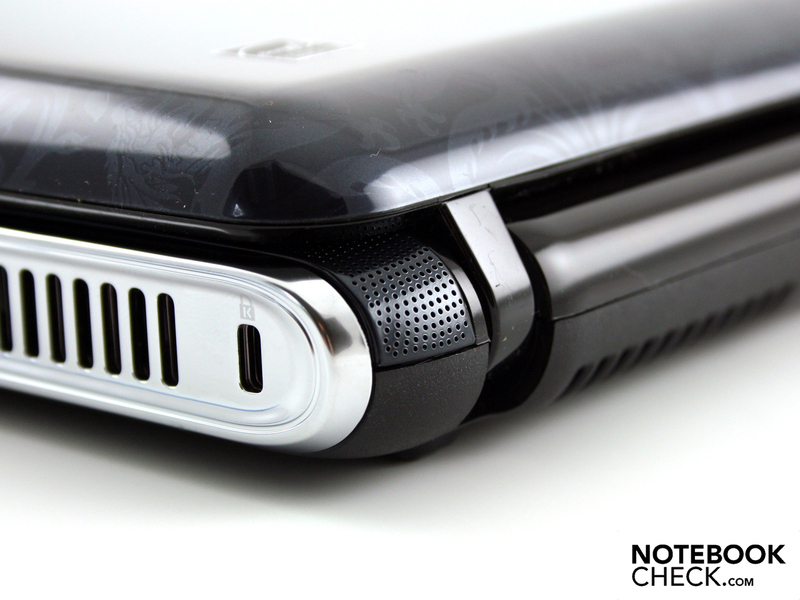 The dedicated HD 4550 can be switched off either automatically (switch to battery power) or manually. Now, the integrated Intel HD in the Core i5 is active. The disadvantage when compared to Nvidia Optimus: By changing, no programs can be accessed on the GPU. In the meantime not only games, but also web browsers, like Chrome or Internet Explorer version 9 and higher, benefit from the dedicated GPU's computer cores. Of course, Chrome and IE9 also work with Intel's HD. Furthermore, the display goes out for 2-3 seconds and must be changed using the multiplexer frame buffer. The Core i5-430M provides high computing power. In order to consider the processing power of the Core i5 in comparison, we’ve looked at the Cinebench R11.5 CPU 64 Bit. The 430M got 2.1 points (90% of the 430M test systems). A core i5-520M with 2.2 points is only marginally better. Completely different is the quad-core 720QM with 3.0 points. The low voltage processor Core i5-520UM (1.3 to 1.6 points when overclocking) leaves the 430M far behind. In return, it has a TDP of 35 watts (including Intel HD graphics), i.e., it consumes a significantly greater amount of current (520UM: 17W TDP). The Pavilion DV3-2390eg steps up with its Core i5 processor together with the dedicated mid-range HD 4550 graphics in order to give a good all-rounder in pretty much all respects. The PCMark Vantage checks the combination of computing performance, harddrive speed, hardware acceleration and GPU (OpenGL 2.0, ATI Stream). 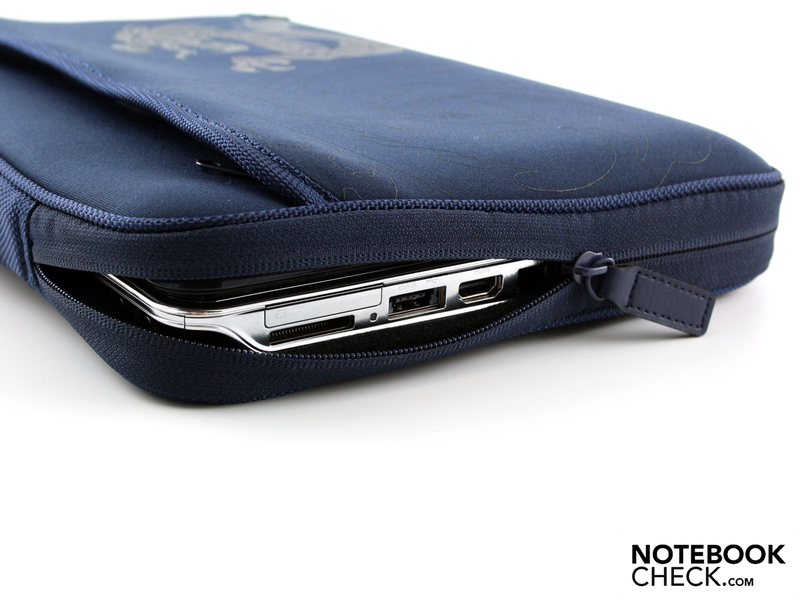 The overall score of 5,448 points is right on the middle range of the 430M notebooks we've reviewed so far. The HD 4550 was active during the test. Some laptops, also with i5 reach 430M CPU, achieved 5,386 (Sony Vaio VPC-EB1S1E/BJ), 5,535 (Asus N71J) or even 5835 points (Packard Bell Easynote TJ75-JO-070GE). The reasons for such differences are usually fast harddrives and more powerful GPUs. The relatively low rating in the PCMark Vantage is not due to a slow harddrive, as the 7.200 rpm HDD reads reasonably fast at 70 MB per second. The Crystal Disk Mark uses a different routine and even gets 76.9 MB/s. The PCMark Vantage HDD score granted the harddrive 3.710 points. Most 5.400 rpm HDDs don't end up with more than 2.500 points. The Western Digital harddrive (WD3200BEKT-60V5TI) has a capacity of 320 GB. At all times in operation, the HDD can be heard with a constant roaring sound; the reason for this being the high rotation speed. 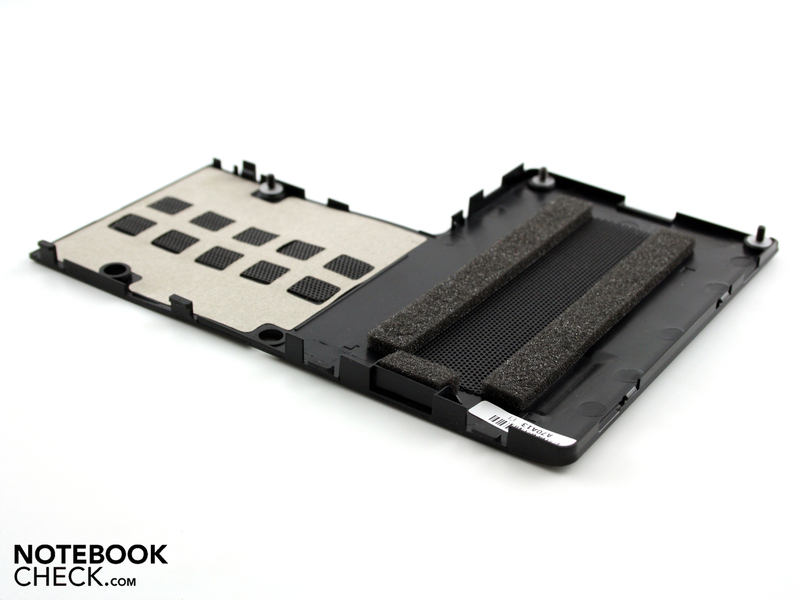 The vibration is transmitted through the chassis onto the tabletop, which starts to vibrate like a sound box. Depending on the sensitivity of the user, the roaring might be bothersome. 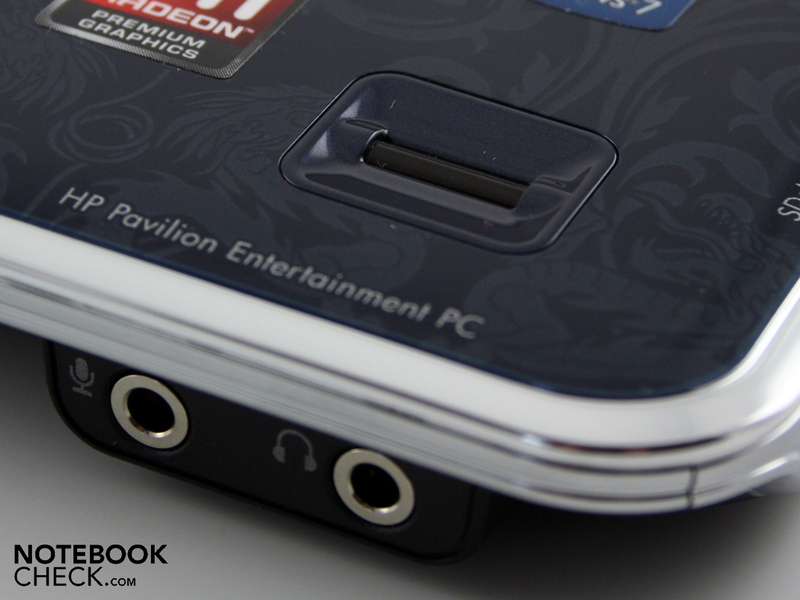 The Pavilion DV3-2390eg is certainly no gaming notebook. The ATI Mobility Radeon HD 4550 manages a limp 3,449 points in the classic 3DMark2006. In comparison, the Packard Bell Easynote TJ75-JO-070GE with the same CPU but with a faster mid-range GPU HD 5650 got 6,674 in the 3DMarks06. Compared to the Intel HD, the HD 4550 is capable of the Avivo HD technology for video functions and the Unified Video Decoder. These features of the graphics card take the burden off the CPU by decoding the H.264/MPEG-4 AVC and VC-1. Under the catchword of ATI Stream, video editing software like Cyberlinks Power-Director 7 can fall back on the computing power of the graphics. However, we couldn't do without conducting a short test of the 3D performance. The tested games clearly show that not much is possible with the ATI HD 4550. Current, and above all demanding games shouldn’t be on the wish list. 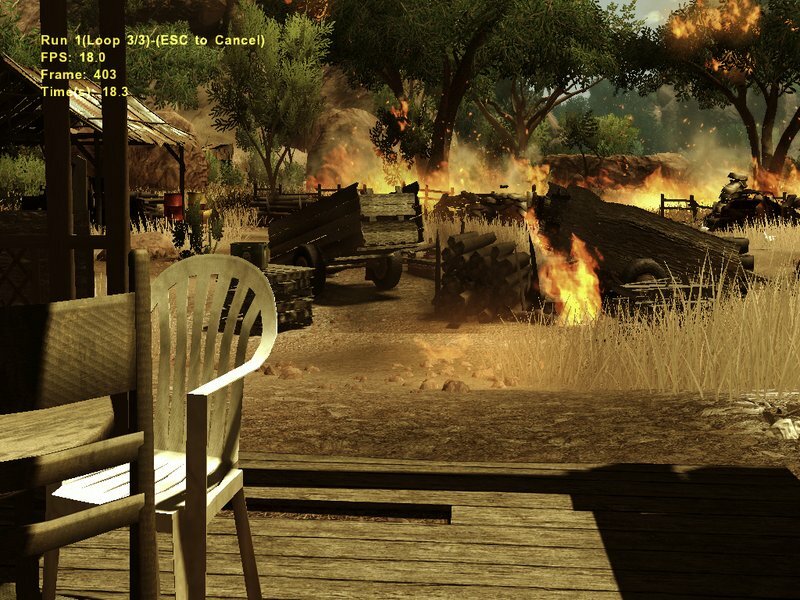 There is enough performance potential for older games like a la Left4Dead or World in Conflict. The noise emissions are a weak point of the Pavilion DV3-2390eg. With or without a dedicated ATI GPU, the fan is never quieter than 34.1 dB (A). It never goes off. If one continually leaves the dedicated GPU running in network operation (default for network operations in each power mode), they will even experience a fan that never gets quieter than 36.5 dB (A). Based on this already clearly audible level, short multi- or single-core processing functions don't really faze the drone of the fan. The noise level rises to a maximum of 39.6 dB (A). Only when we run the laptop at full load (stress test, Prime95 + Furmark) does the dv3 reach the maximum possible speed: 47.4 dB (A). 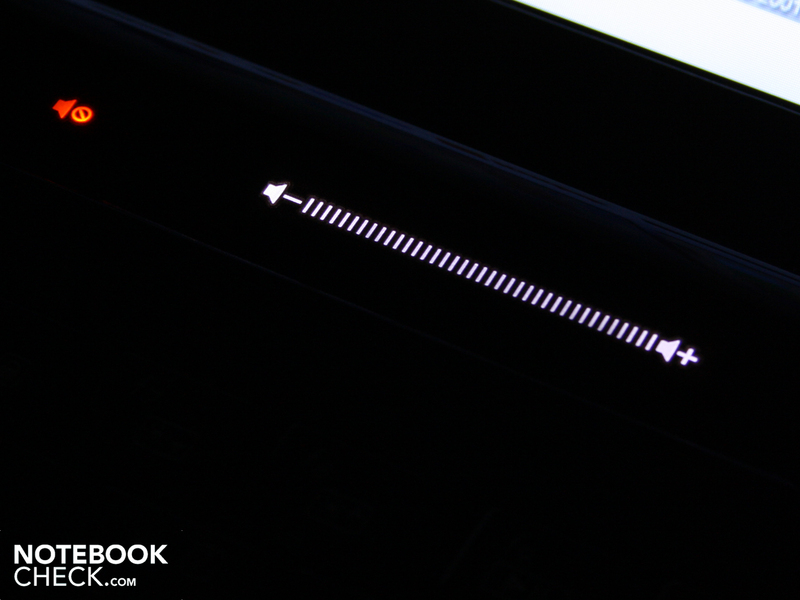 This is extremely loud and reminds us of gaming laptops. However, the speed is constant and there are no annoying fluctuations. In the gaming tests and the 3D-benchmarks, the volume rises to 42.1 dB (A). This also applies to the applications which put a great deal of demands on the GPU. When HP's 13.3 incher doesn't have much to do (idle), then the temperature of the working area stays at an average of 27 degrees Celsius. Things aren't much worse on the base plate where it is at its warmest 34 degrees. 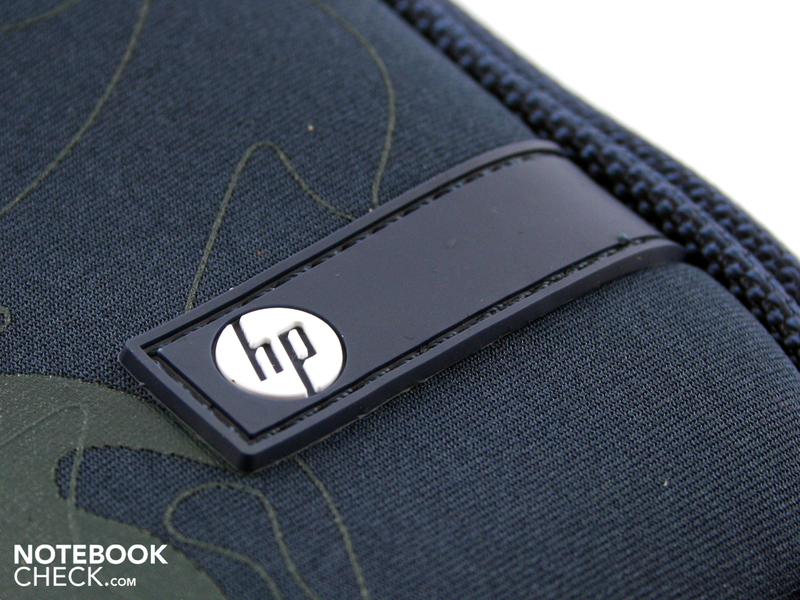 Surfing with the HP Pavilion dv3 can be done safely on one's lap. During the stress tests (two hours), the area around the air outlet (bottom) heated up to 51 degrees, limiting its usability on one's lap. The air intake opening definitely shouldn’t be obstructed. The temperatures on the palm rest remain pleasant at all times, whether under load or at idle. We measured a maximum of 34 degrees (stress test). 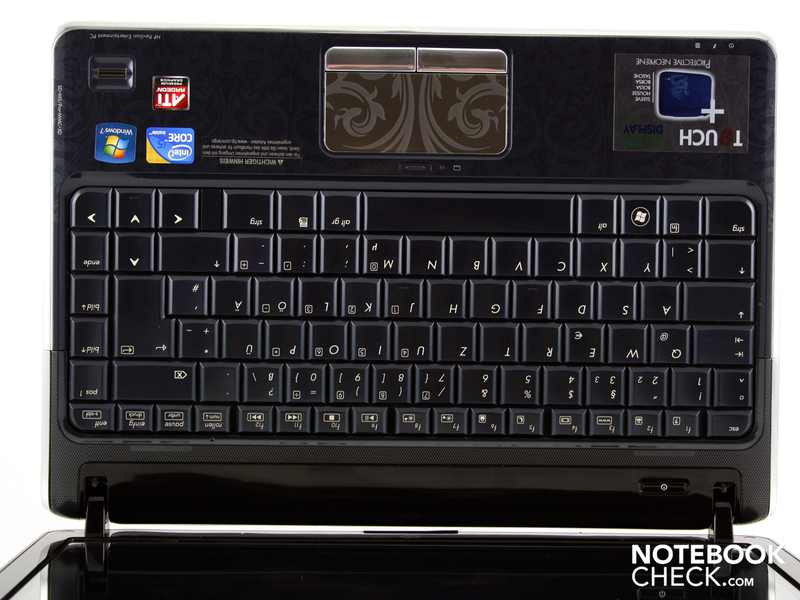 The best thing about the HP-dv3 2390eg acoustics is the simple regulation of the sound level via the illuminated touch panel above the keyboard. The volume can be adjusted with a striking motion or a gentle tap on plus/minus. The mute button ensures an immediate silence. The two stereo speakers rest just above the keyboard under the black grid. The Altec Lansing logo doesn’t do what its name promises. The sound is too pronounced in the mid-range and we couldn’t detect any bass with our ears. The best sound we experienced was achieved when the sound options of the Virtual Surround and bass are turned on. But it worked with the volume. The tiny membranes aren't distorted when working at the highest level and it can even fill a small room with sound. 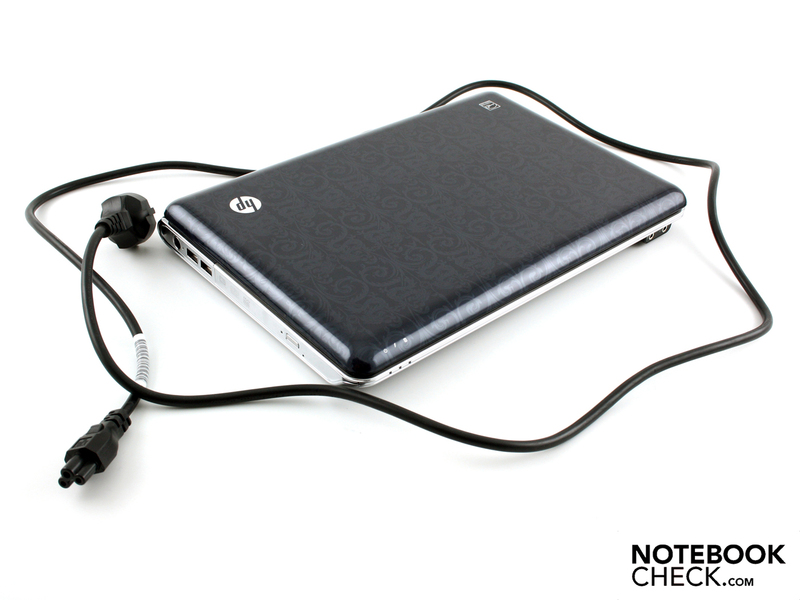 The HP dv3 delivered good results when external loudspeakers were hooked up. Even with a low sound level applied to the 3.5 millimeter headset output, the sound delivery of the speakers remains rustle-free after multiple amplifications. We tested this with two powerful Yamaha speakers (YST-M20SDP). 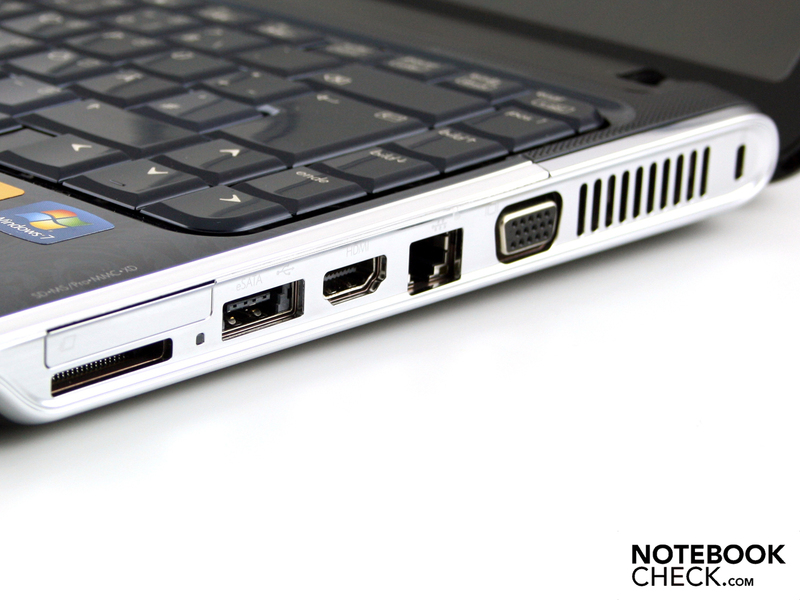 The dv3 is perhaps interesting for mobility fans as it can switch off its mid-range graphics HD 4550. Could it deliver decent run time even without having Nvidia Optimus in play? Can this be true? We measured the runtimes with an active Intel HD, except for the load test. With a 55 watt hour battery (5,100 mAh) score, the dv3 achieves good, but not outstanding runtimes. 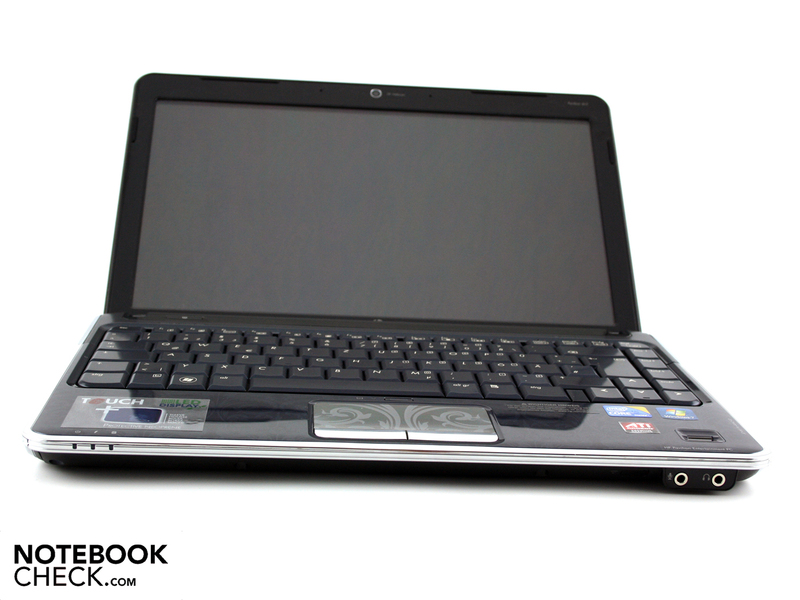 In a continuous web-surfing session with wireless enabled, the multimedia subnotebook managed three hours (186 minutes). Thrifty people might be able to raise the battery life to five hours (305 minutes) (BatteryEater Reader) on maximum energy saving settings. Like with Wi-Fi surfing, the DVD film runs for three hours (184 minutes). When the processor is under heavy load (BatteryEater Classic Mode) on active HD 4550, the runtimes dwindles much faster and is done after 92 minutes. The runtimes don't appear to be particularly strong for a 13.3-incher. With the same CPU, the 14-incher Acer Aspire 4820TG-434G64Mn manages 300 minutes (66 Wh) and the 15.6-incher Acer Aspire 5820TG-434G32MN manages 299 minutes (66 reps) in the WLAN test. 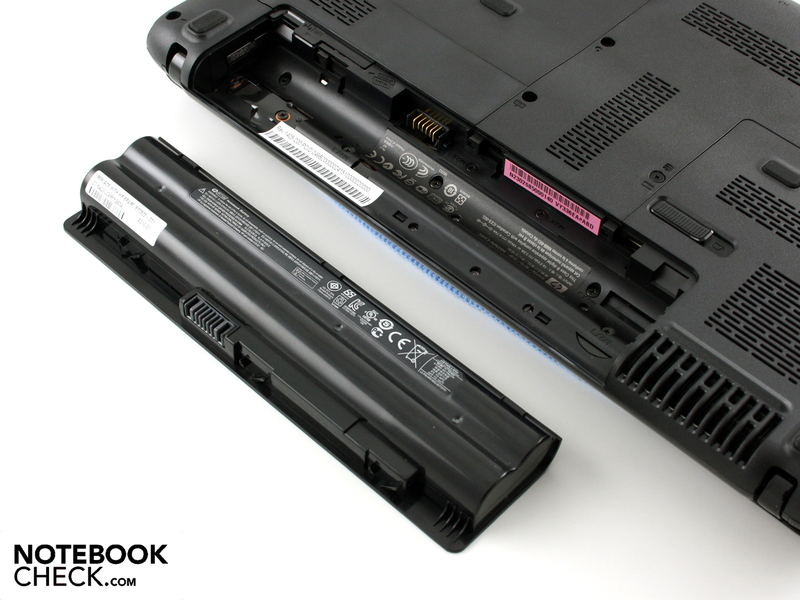 Also, the sister model HP ProBook 6540b with an identical configuration achieves 252 minutes (55 Wh). 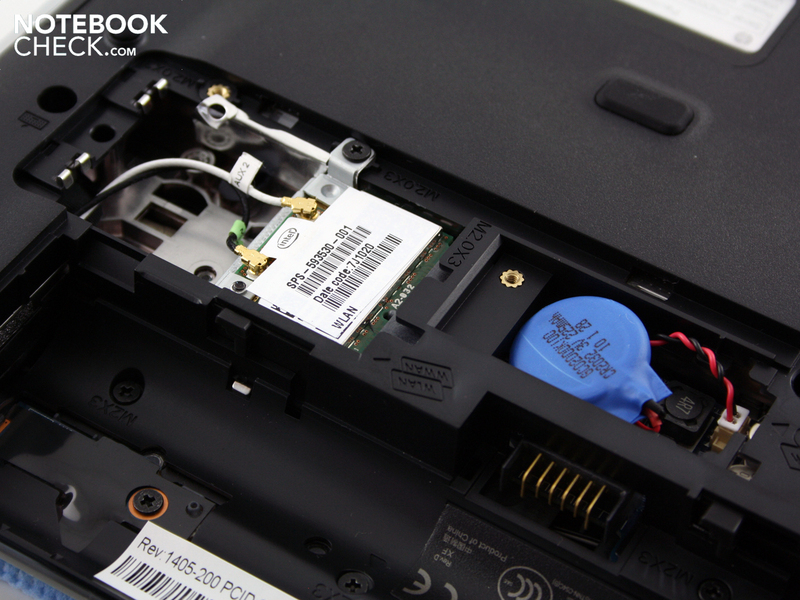 On the other hand, there are also 13.3" competitor models such as the Packard Bell EasyNote Butterfly s (49 Wh), which with a Low Voltage i5-520UM also only achieves 205 minutes (WLAN test). Idle with Intel HD 305 min. Last with HD 4550 92 min. Those looking to upgrade the dv3 to its highest possible energy saving potential should permanently deactivate the dedicated ATI HD 4550. 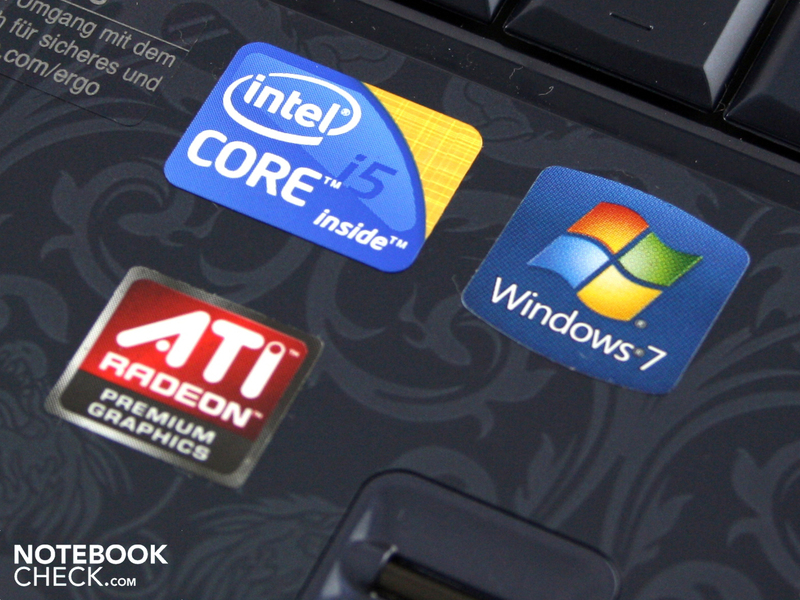 The difference between Intel and ATI HD is relatively significant at four to six watts. The current consumption at idle is 16 watts (Intel HD) and 22.3 watts (ATI). The latter is a very high current consumption at idle. To compare: 16 and 15.6 inchers like the Toshiba Qosmio F60-10H (i5-430M) and the Sony Vaio VPC-EB1S1E/BJ, both of which have non-switchable dedicated GPUs, require much less energy (EB Vaio 16.8 Watt, 15.5 Watt F60 ). 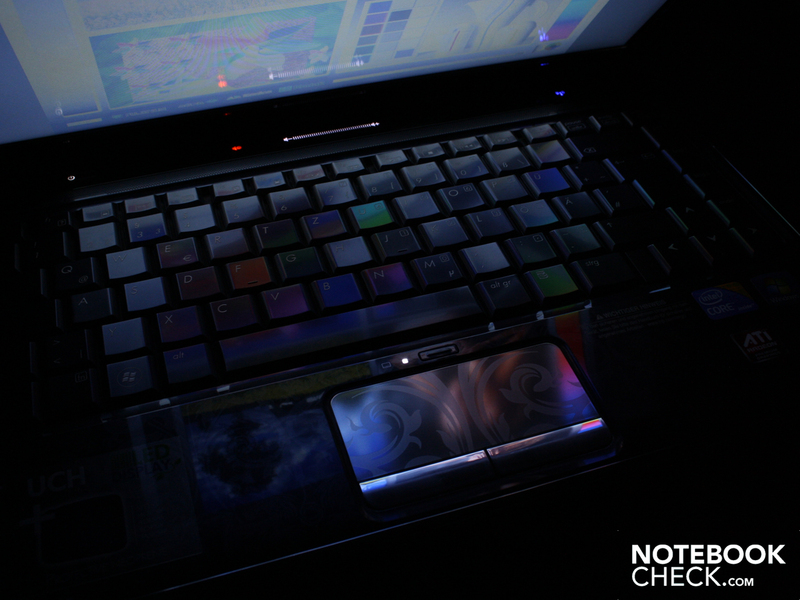 In short: No matter whether with or without a dedicated GPU, the dv3 uses too much energy at idle when doing nothing. When the HD 4550 is very hard at work, the operating power increases to 58.6 watts (3DMark06). We achieved the maximum possible current consumption using the Prime95 and Furmark stresstests. Our multimeter showed 69.2 watts. Knowing that, the 90 watt power pack is more than adequately dimensioned. 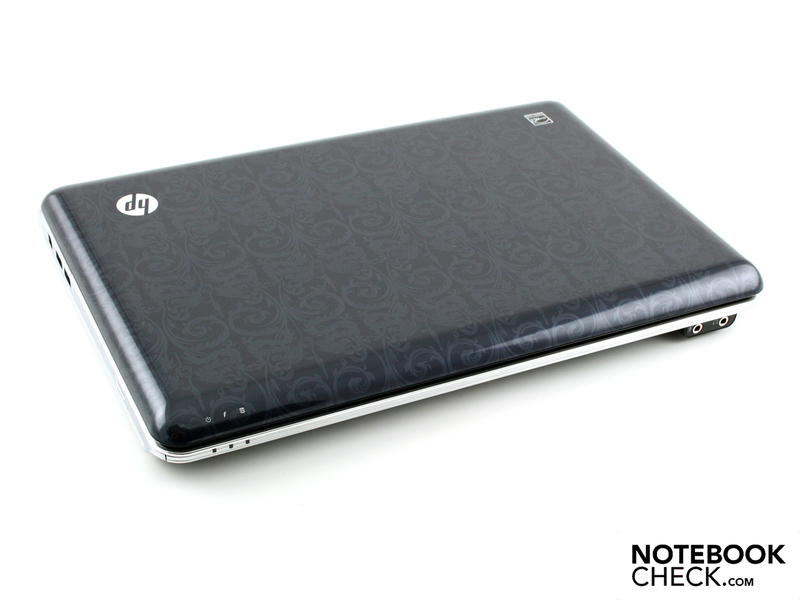 The HP Pavilion dv3-2390eg (VY336EA) is a small entertainer in a handy 13.3 inch package. 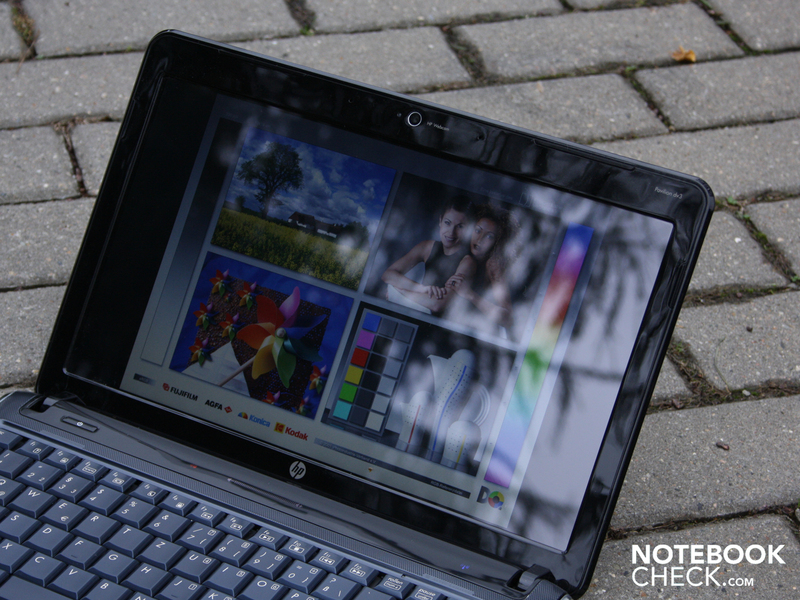 Although the high-gloss Mini is very heavy for the subnotebook class at 2.380 kg, it does still have the kind of performance worthy of a middle-class multimedia notebook. This is thanks to the potent Core i5-430M and fast 7,200 rpm hard drive. But its gaming performance can’t compete with the rest of the middle class; the ATI Mobility Radeon HD 4550 (DirectX 10.1) with 3449 3DMarks06 is just simply too weak. A potentially useful feature, and for some the main reason for purchasing, is the touch panel. 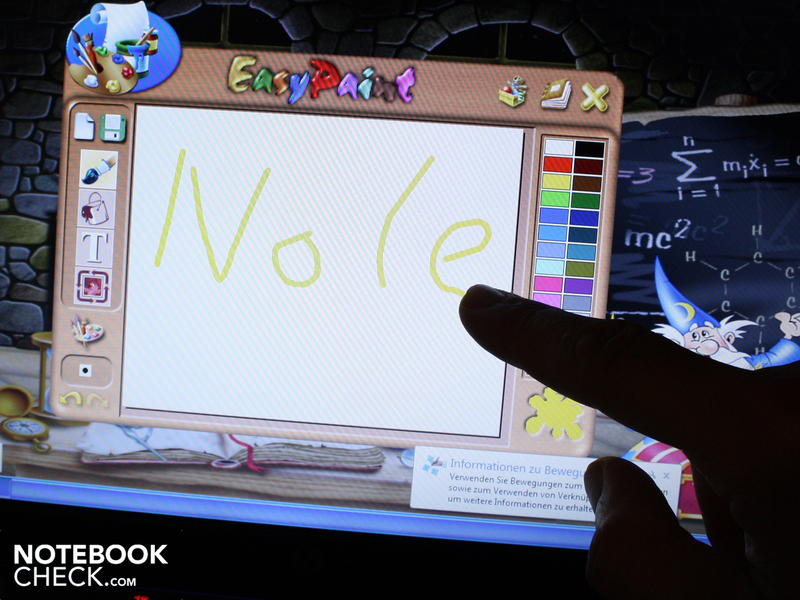 With the finger (but not with the stylus pen or other objects), Windows can be administered quite well. Whether or not this results in a completely smeared glare panel is dependent on the buyer and his individual use of it. The battery life of three hours is quite OK (WLAN test), but even some 16-inchers with more potent HD 5650 last significantly longer. The ATI graphics, which can be switched off, did reduce its appetite for energy. The current consumption is nevertheless over the level of frugal 15.6-inchers without hybrid graphics. The poor contrasts and unstable viewing angles of the display did not give an impressive showing in our rating system. Additionally, there are the consistently and clearly audible fan as well the very high noise levels under load. Sensitive people will be disturbed by the hard drive, which also transmits a constant droning to the tabletop. On the up-side, one can mention the numerous connections (ExpressCard, eSATA) and the solid construction of the base unit and lid. 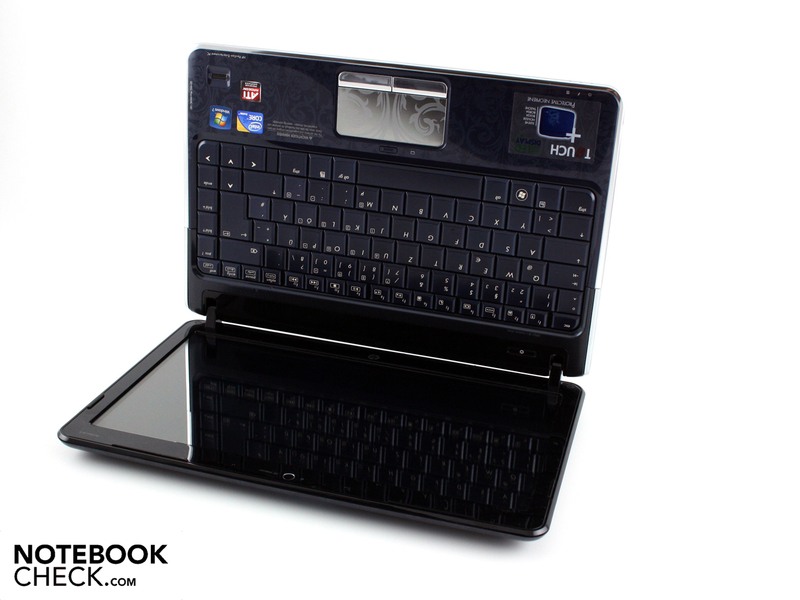 The keyboard impressed on the one hand with its layout, stroke and tactile feedback. On the other hand, the keys have a smooth, almost greasy surface. 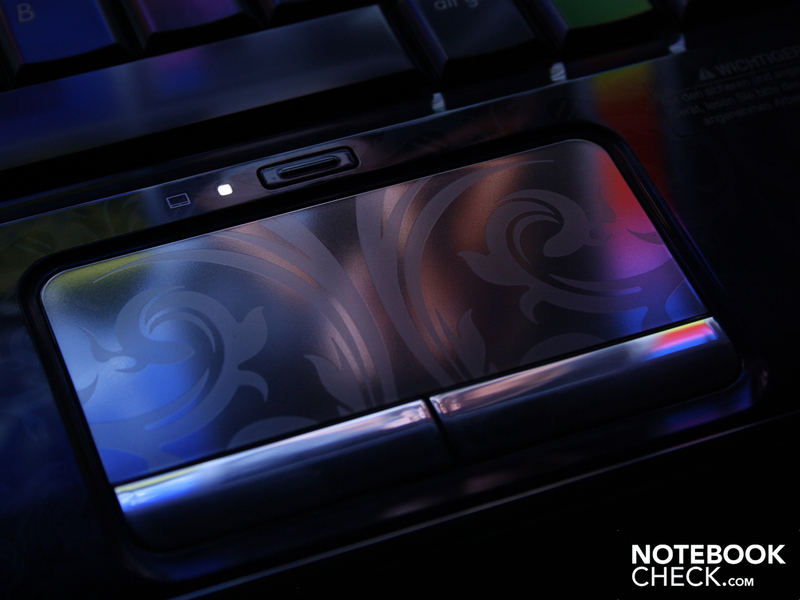 Greasy is also the keyword for the touch pad, which despite its high level of accuracy, couldn't convince us. The buttons on the mouse pad also need a lot of pressure and they click loudly. The base unit gives under the DVD drive. 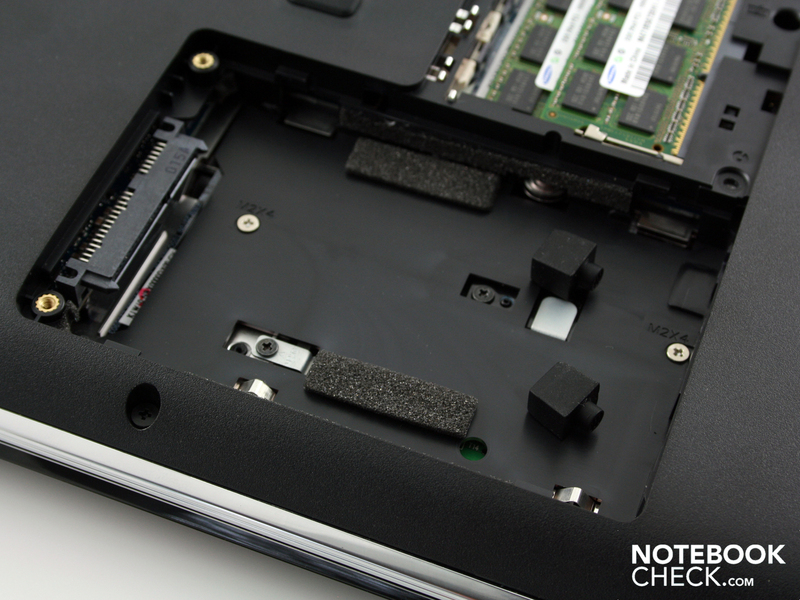 The battery can be removed for the writing operation, there are no feet attached to it. 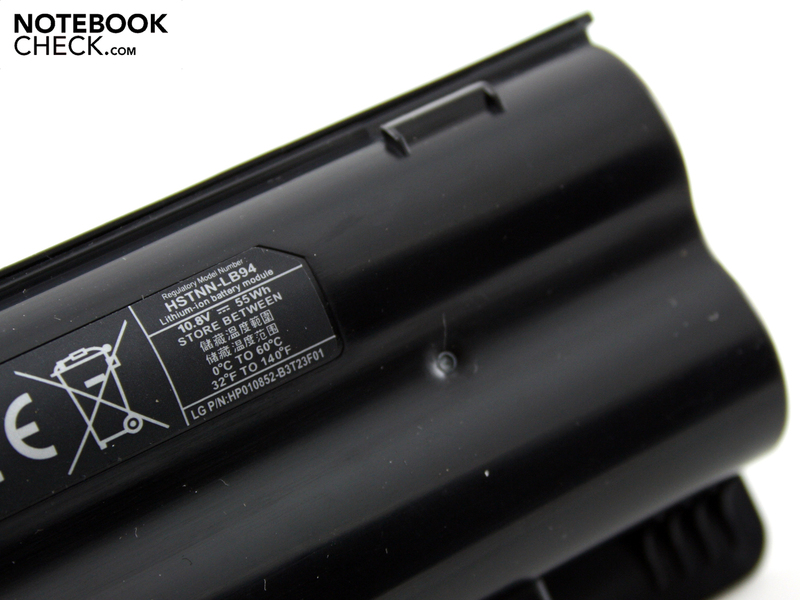 The 6-cell battery has a capacity of 5100 mAh. In the battery area, we see preparation for a SIM-card holder. this door has to be removed. and the 2.5-inch SATA hard drive in its lightly padded shaft. The WLAN module is installed as a Mini PCI Express. It does not contain no recovery media (but a mini-remote control). A neoprene carry bag is included. The 13.3-incher fits exactly in. The bag is of high quality. The power unit, with its 349 grams, is a medium-sized fragments. 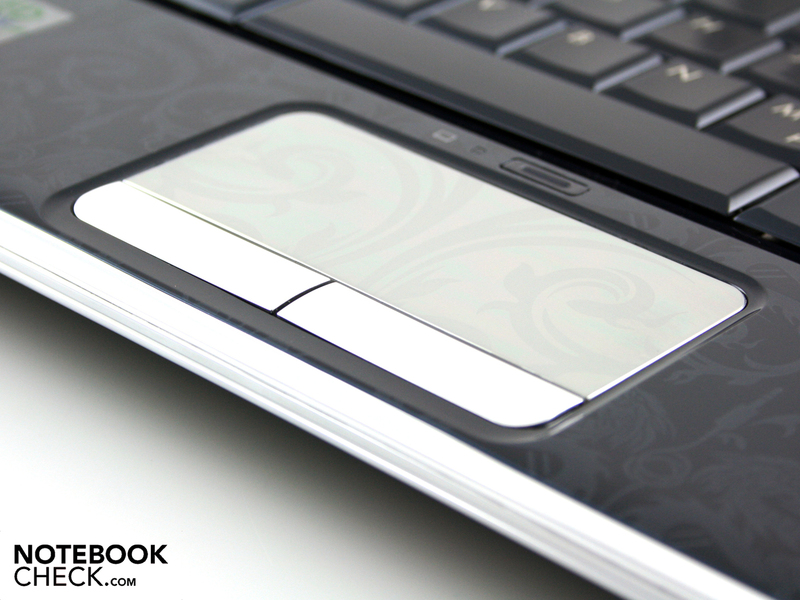 The buttons and the similarly smooth touchpad affect reflections. Prolific writers won't be pleased with the smooth texture. 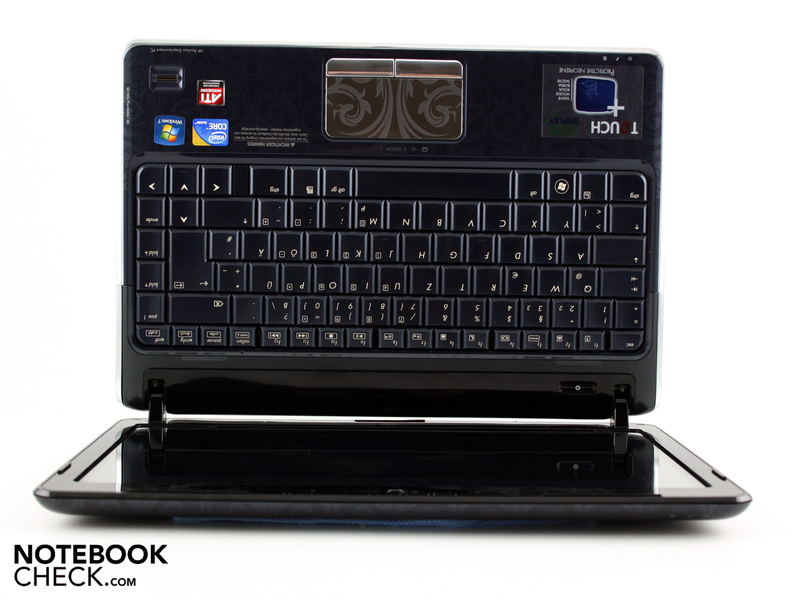 The keyboard has a clear layout with large keys. it looks like a normal foldaway PC. The display panel can be operated with your finger (touch screen). The 13.3-incher shows off with a stylish look. 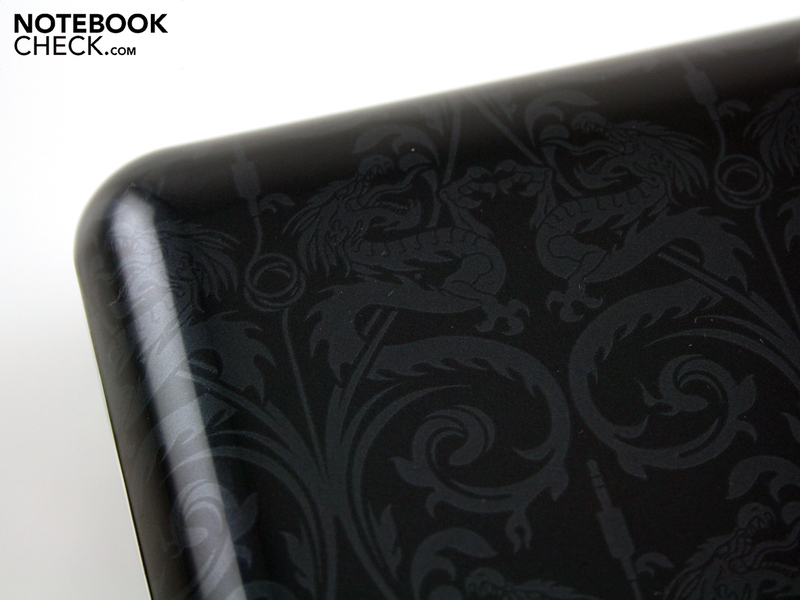 The palm rest is decorated with a dragon pattern and high gloss. The same applies to the stable but thick cover. The pretty pattern is spoilt in a matter of seconds by greasy fingers. The hinges are secured on the base unit and hardly move. The round design form makes no pretences of being slim. After all, there are many ports and an optical drive (left). There is also eSATA and HDMI. The fingerprint reader is used in the consumer logging / data access via fingerprint. 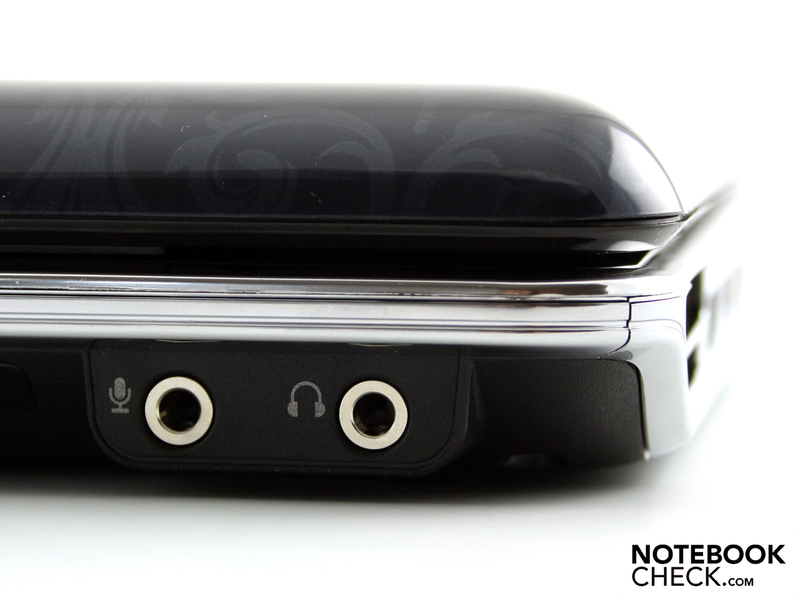 The front side includes only the headphone output and microphone input. The volume can be controlled / disabled by this touch strip. The consumer receives the IR signal from the supplied remote. 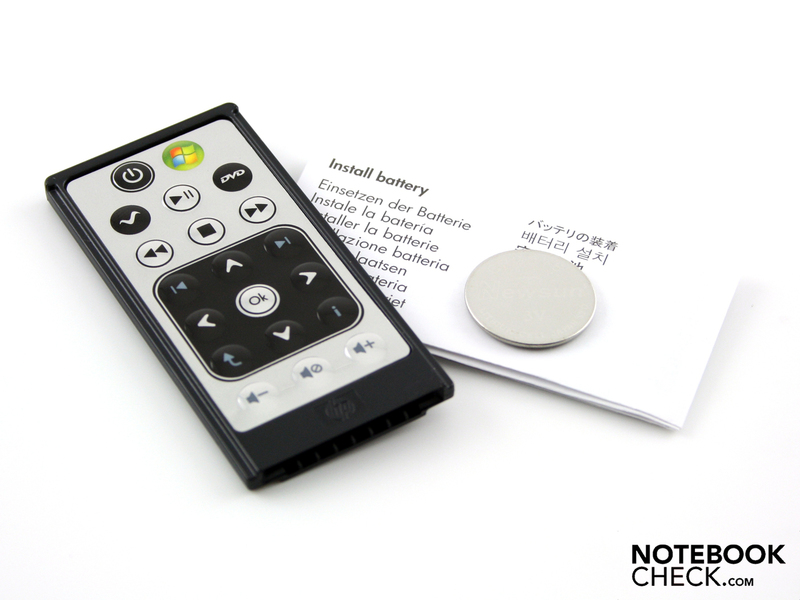 The CIR interface (Consumer Infrared) only supports remote controls. The power cord is typically long. Users get to around 3.5 meters. 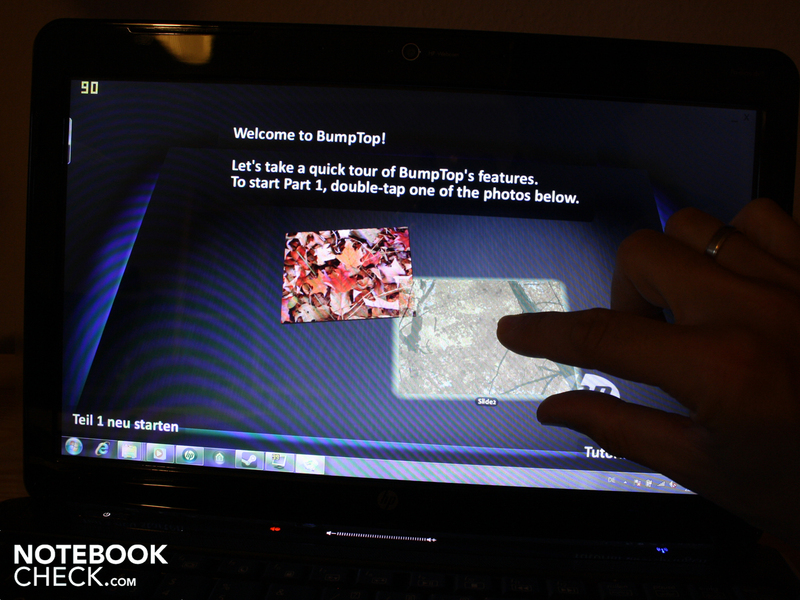 Targeted touch input without recalibration. From every part. More brightness, more matte surfaces, more battery life, less system noise. 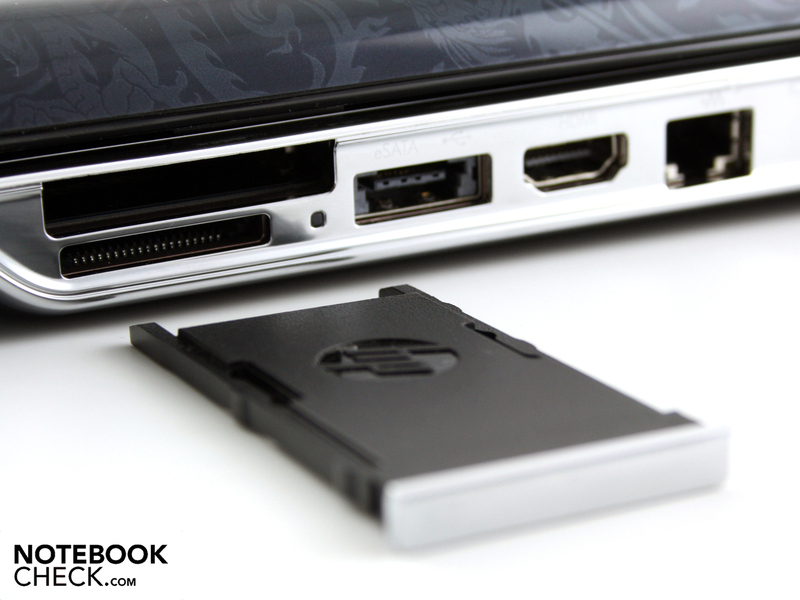 How HP manages to build a 7,200 rpm HDD with a droning effect in nearly all its laptops.